a. Estate Tax Repealed for 2010. The federal estate tax was repealed midnight, December 31, 2009. If Congress fails to act in 2010, the estate of every decedent who dies this year will owe no federal estate tax. This could complicate existing wills. As it now stands, the estate tax will return on January 1, 2011, and the exemption amount will be reset at pre-2001 levels. This means the applicable exclusion amount will be $1 million, and the highest estate tax rate will be 55%. Throughout this period, the maximum New York Estate Tax rate will be 16%. i. State Death Taxes. In 2010, the credit for state death taxes would reappear, replacing the current deduction for state estate taxes. b. Exemption Amount for 2011 Not Certain. This “default” scenario could change if Congress passes legislation later this year (retroactive legislative action after 2010 would likely raise constitutional problems) which President Obama signs. The House passed a bill in December that would have permanently extended the $3.5 million exemption and the 45% top estate tax rate in effect in 2009. However, the Senate failed to act, with Republicans and conservative Democrats favoring a higher exemption amount of $5 million. Mr. Obama favors a $3.5 million exemption amount and a top estate tax rate of 45%. i. Congressional Delay Reduces Likelihood of Retroactivity. Delay Lessens If Congress waits past the summer to reinstate the estate tax, Congress may decide to forego retroactivity. This, despite the significant loss in tax revenues. If Congress does elect to reinstate the estate tax retroactively any time this year, the Supreme Court will more than likely be called upon to decide the constitutionality of the measure. Since there are far fewer estates subject to estate tax, the risk of estatae tax audit may have increased substantially. The number of taxable estates has decreased from 45,000 in 2002 to 5,400 in 2009.
d. New York Estate Tax. New York still imposes an estate tax on taxable estates in excess of $1 million. The rate Therefore, it may be prudent for a New York testator to leave at least that amount outright or to a credit shelter trust to make use of the $1 million New York exemption amount. The rate of tax imposed ranges from about 10 percent for taxable estates of $2 million to 16 percent or estates over $10 million. ii. Transfers between spouses (whether by gift or sales) are considered gifts. Therefore, the transferee spouse takes a carryover basis. (IRC § 1041; Treas. Reg. § 1.1041-1T(d), Q&A 11. Since the gift qualifies for the marital deduction, no gift tax liability will arise. IRC §2523. iii. Gifts of property with a realized loss to related parties who are non-spouses may have some benefits, depending upon whether the property increases in value. While the basis for determining later loss is the lower basis at the time of the gift. IRC § 1015(a), if the asset recoups its value, the basis for determining later gain is the original basis, increased by any gift tax paid. IRC §1015(d)(6). f. Importance of Will. If a person dies intestate (without a will), then the rules of intestacy found in EPTL 4-1.1 will apply in determining who receives the decedent’s property. The estate of a person who dies intestate also needs to be administered, and administration can be more complicated in situations where no will exists. i. Bonding Requirements. Often, a will provides for a waiver of bond otherwise imposed on the executor. If there is no will, there can be no waiver of bond with respect to the administrator. In that case, the Surrogate may require the administrator to post a bond. ii. Intestacy Formula for Distribution. Under EPTL 4-1.1, the spouse of a person who dies intestate receives one-half (plus $50,000) of the decedent’s estate. The right of election found in EPTL 5-1.1A provides that a spouse who is bequeathed less than 1/3 of the predeceasing spouse’s estate, may elect against the estate and take 1/3 of the estate. Taken in combination, these provisions create the situation whereby a spouse who wishes to leave less than one-half of his estate to his spouse needs a will to accomplish this. g. Transfers to Non-Grantor Trusts Beginning in 2010. IRC §2511(c) treats transfers to trusts made after December 31, 2009 as taxable gifts unless the trust is a wholly grantor trust under IRC §§ 671-679 as to the donor or the donor’s spouse. The statute is intended to prevent the donor from making a transfer complete for income tax purposes but incomplete for transfer tax purposes, thereby shifting income tax responsibility without incurring gift tax. i. Effect of Provision on New York Residents. One of the effects of the new rule will be to impede the use of “Defective Intentional Non-Grantor Trusts” (“DING” trusts), a variation of intentionally defective grantor trusts (discussed below) which have been used by New York State residents to avoid New York State capital gains tax on sales of appreciated assets. By selling appreciated assets to a trust with no New York Trustees and no New York source income, the sale of those assets will produce no New York income tax. While the technique will still produce the favorable intended New York State income tax result, the result in 2010 will be that the grantor will be required to report the transfer as a taxable gift. h. Section 2053 Final Regulations. Treasury issued final regulations limiting the estate tax deduction for unpaid claims and expenses. With respect to decedents dying on or after October 20, 2009, an estate may deduct an expenditure only if the claim or debt is actually paid. Under the new regs, the amount of claim or expense may be determined by (i) court decree; (ii) consent decree; or (iii) settlement. No deduction is allowed to the extent a claim or expense is or could be reimbursed by insurance. Notice 2009-84.
i. Nevertheless, several exceptions exist to the rule requiring actual payment. If a potential for reimbursement exists, the claim may still be deductible if the executor provides a “reasonable explanation”” of why the burden of collection would outweigh the anticipated benefits of collection. Another exception provides that a claim or expense may be deducted by the estate if the amount to be paid is ascertainable with “reasonable certainty.” No deduction may be claimed for claims that are contested or contingent. i. GST Tax Uncertainties in 2010. The GST tax will reappear in 2011, at an amount equal to $1 million, indexed for inflation since 1997.
i. Overview of Generation Skipping Transfer Tax. IRC Chapter 13 imposes a GST tax on all transfers, whether made directly or indirectly, to “skip” persons. Under IRC §2613(a), a skip person includes a person who is two or more generations below the generation of the transferor or a trust, if all of the interests are held by skip persons. Under IRC §2611(a), transfers subject to the GST tax are direct skips, taxable distributions, and taxable terminations. The GST tax thwarts multigenerational transfers of wealth by imposing a transfer tax “toll” at each generational level. ii. Rationale for GST Tax. Prior to its enactment, beneficiaries of multigenerational trusts were granted lifetime interests of income or principal, or use of trust assets, which lifetime interests never rose to the level of ownership. Thus, it was possible for the trust to avoid imposition of gift or estate tax indefinitely. The GST tax, imposed at rates comparable to the estate tax, operates for the most part independently of the gift and estate tax. Therefore, a bequest (i.e., transfer) subject to both estate and GST tax could conceivably require nearly three dollars for each dollar of bequest. The importance of GST planning becomes evident. Generation Skipping transfers are taxed at the highest estate tax rate imposed under IRC § 2001.
iii. Calculation of GST Tax Imposed on Transfer. IRC §2602 provides that the amount of the GST tax imposed on a transfer is determined by multiplying the amount transferred by the “applicable rate.” Under IRC §2641, the applicable rate is the maximum federal estate tax rate multiplied by the “inclusion ratio.” The inclusion ration is one minus the “applicable fraction.” The applicable fraction is a formula designed to reflect the property that will be taxed under the GST tax rules. The GST tax exemption is the numerator of the fraction. Therefore, if more of the GST tax exemption is allocated to the transfer, the fraction will be greater, the inclusion ratio will be less, and the GST tax with respect to the transfer will be less. iv. GST Exemption. IRC §2631 allows every transferor a GST exemption that may be allocated to transfers made by the transferor either during the transferor’s life or at death. Affirmative allocations of GST exemption are generally made on Form 709. Under IRC §2642(b)(1), if a transferor allocates GST exemption on a timely filed gift tax return, the transferor may allocate an amount of the GST exemption equal to the value of the property on the date of the transfer to reduce the inclusion ratio to zero. Automatic allocations of GST exemption are made under IRC §2632 to certain transfers made during life that are direct skips, so that the inclusion ratio for such transfers may be reduced to zero even without any affirmative allocation of GST exemption. (1) Caution. Under the automatic allocation rules, the exemption is applied first to direct skips, which are least costly type of GST tax. Therefore, it may be prudent at times not to have GST Exemption automatically allocated to direct skips. v. GST Tax Has No Application in 2010. Although technically not repealed in 2010, the generation-skipping transfer (GST) tax will have no application in 2010, as there is no estate tax. This also means that transferors will not be able to allocate any GST exemption to transfers made in 2010. As is the case with the estate tax, the GST tax will “spring back” into life on January 1, 2011. (1) Uncertainties in Application of GST Tax. However, by reason of the language in the sunset provision in the 2001 Tax Act, i.e., “the the Internal Revenue Code of 1986 shall be applied . . . as if the provisions [in the 2001 Tax Act] had never been enacted,” various uncertainties arise in the application of the GST tax. For example, will GST exemptions allocated trusts after 2001 but before 2010 be allowed? Also, will decedents who die in 2010 with testamentary trusts be treated as transferors for GST purposes? Since transfers to trusts will not be subject to estate tax in 2010, such decedents might not be considered “transferors” within the meaning of IRC § 2652(a). A number of GST provisions are also scheduled to sunset in 2011 without further legislation. Among those are the allowance of a retroactive allocation of GST exemption under certain circumstances, and a late election to allocate the GST exemption. (1) Direct Skips. The first type of taxable transfer is a direct skip under IRC § 2612(c). A direct skip is an outright transfer or a transfer in trust for the benefit of a person which skips a generational level, and is subject to the gift or estate tax. A grandparent’s outright gift (in excess of the annual exclusion amount) or gift to a trust for the benefit of a grandchild would be a direct skip. Tax liability for a direct skip is imposed on the transferor in an outright direct skip, but on the trustee in the case of a transfer in trust. IRC § 2603(a). The amount subject to tax is the amount actually received by the transferee. (2) Taxable Distributions. The second type of taxable transfer is a taxable distribution under IRC § 2612(b). A taxable distribution is a transfer from a trust to a skip person. An example would be a discretionary distribution by a trustee to a grandchild of income or principal from a trust being held for the grantor’s child. Payment of this tax is the obligation of the distributee. IRC § 2603(a). The amount subject to tax is the amount received by the distributee. IRC § 2621. If the trust pays the tax on behalf of the beneficiary, this will result in an additional distribution subject to the GST tax. (3) Taxable Terminations. The third type of taxable transfer is a taxable termination under IRC § 2612(a). A taxable termination is the termination of any present interest in a trust by death, lapse, exercise or nonexercise. Payment of this tax is the obligation of the trustee. IRC § 2603(a). There are two exceptions, the first being that there is no taxable termination if immediately after the termination, a non-skip person has a present interest in the propertythat is more than nominal. To illustrate, a trust is created for a child, and upon the child’s death, to the grandchild. While the death of the child would constitute a taxable termination, the death of the grandchild during the child’s life would not. The second exceptions provides that there will be no taxable termination if “at no time after such termination may a distribution . . . be made from such trust to a skip person.” Therefore, in the example, if upon the child’s death a charity were to receive the trust property, there would be no taxable termination. The amount subject to tax is the amount subject to termination. vii. Direct Skips Result in Fewest Taxes. Of this troika of GST taxable events, lifetime “direct skips” result in the fewest GST taxes, since the tax is calculated on the value of the property that the skip person receives. Still, transfer taxes (GST and gift or estate) will consist of 122% of the amount transferred. In contrast, taxable terminations and taxable distributions of trusts which occur at death result in much higher GST tax liability, since an estate tax, which could nearly halve the estate, is imposed first, followed by the GST tax, which exacts another like amount. Taxable terminations and taxable distributions from trusts at death should be avoided wherever possible. i. Testators at Risk of Death in 2010. Wills for testators at risk of death in 2010 should be reviewed. Existing wills may contain a formula provision allocating the maximum amount which can pass free of estate tax to a credit shelter trust. Since there is no estate tax in 2010, the amount called for in the formula could consume the decedent’s entire estate. Most testators who included this formula provision were motivated by a desire to avoid burdening the estate of the surviving spouse with unnecessary estate tax liability, not a desire to disinherit the spouse. However, if no estate tax exists, then this surprising result could occur. Similarly, a bequest to a QTIP trust of the maximum amount qualifying for the estate tax deduction may be difficult to interpret if there is no estate tax for which a deduction could be claimed. (1) Consider Converting Realty to Personalty. If the taxpayer resides in Florida, which has no estate tax, but owns real property in New York (or any state that has an estate tax), contributing the real estate to an LLC or partnership may avoid the estate tax. This is because interests in personal property are generally taxed in the state of domicile, while interests in real property are taxed in the state where the real property is situated. Thus, if a Florida resident owns real property in Manhattan outright, New York will impose an estate tax. However, if the real estate in New York is owned in an LLC, New York may not be able to recover an estate tax. (a) Converse situation. Since personal property is taxed in the state of domicile, it would be inadvisable (from an estate tax standpoint) for a New York resident to own out of state personal property in the form of Florida real estate held in an LLC. (2) New York imposes estate tax on a pro rata basis to nonresident decedents with property subject to New York estate tax. (a) NY Imposes No Estate Tax on Nonresidents’ Intangibles. NYS-DTF Memorandum TSB-M-92 provides that “New York has long maintained a tax policy that encourages nonresidents to keep their money, securities and other intangible property in New York State.” TSB-A-85(1) further provides that shares of stock of a New York corporation held by a nonresident are not subject to New York estate tax since shares of stock are considered intangible personal property. (i) Caution. TSB-A-08(1)M, provides that an interest of a nonresident in an S Corporation which owns a condominium in New York is an intangible asset provided the S Corporation has a legitimate business purpose. Presumably, if the S Corporation had only a single shareholder, and its only purpose was to hold real estate, New York could attempt to “pierce the veil” of the S Corporation and subject the condominium to New York estate tax in the estate of the nonresident. (3) Divesting New York of Trust Jurisdiction. Planning to divest New York of jurisdiction to impose fiduciary income tax on undistributed trust assets can produce large tax savings. Tax. Law §605(b)(3) taxes trusts created by New York settlors. However, a resident trust is not subject to tax if (i) all trustees are domiciled in a state other than New York; (ii) all property, both real and intangible, is located outside of New York; and (iii) all income and gains of the trust are derived from sources outside of New York. Therefore, New York will not tax a trust that has no New York trustees and no New York assets or income. (a) Illustration. A trust created by a New York resident and administered in New York must pay $76,992 of New York State tax on a capital gain of $1 million. However, if the trust were domiciled (or redomiciled) in Delaware, this tax would be avoided, as Delaware imposes no income tax on capital gains incurred on an irrevocable nongrantor trust provided that no remainder beneficiary lives in Delaware. Del. Code Ann., §§ 1101-1243. (b) Planning Technique. The sale of an asset by a New York resident with a large potential capital gain to a trust with no trustees in New York, no assets in New York, and no New York source income, will not be subject to New York tax. (i) Technique Eclipsed by New IRC Provision. Since IRC §2511(c) now imposes gift tax on sales of assets to nongrantor trusts, this technique loses some of its luster. However, since the gift tax exclusion amount is $1 million, the technique may still be beneficial for some grantors. ii. Source of New York State Estate Tax Payments. New York Estate tax can be paid out of either the marital trust or the credit shelter trust. Since New York State estate tax qualifies as a deduction for federal estate tax purposes, it makes no difference for federal estate tax purposes whether New York State estate taxes are paid out of the marital share or the credit shelter share. However, New York estate tax liability will differ depending on whether the payment comes from the marital share of the credit shelter share. If payment is made from the credit shelter share, the amount of the credit shelter will be reduced by $229,500. However, despite the fact that the credit shelter will be reduced, it is still preferable for New York estate taxes to be paid out of the credit shelter share. If New York estate taxes are paid out of the marital share, a loss of the marital deduction will cause New York estate tax will increase to $254,911. In this case, the credit shelter, which could be subject to future estate tax in the estate of the surviving spouse, will not be reduced. 2. Carryover Basis. Prior to 2010, property acquired from a decedent generally received a stepped-up basis under IRC § 1014. The purpose of the statute is to avoid the double taxation that would result if the asset were first subject to estate tax at the death of the decedent, and then to income tax when the beneficiary sold the asset after the decedent’s death. Since the estate tax has, for the time being at least, been repealed, no double taxation would result from the loss of the step-up in basis at death. For decedents dying after December 31, 2009, the basis of property acquired from a decedent is the lesser of (i) the decedent’s adjusted basis or (ii) the fair market value of the property at the decedent’s death. IRC § 1022(a)(2). Many estates that would not have been subject to estate tax at the $3.5 million applicable exclusion amount threshold will be subject to the new carryover basis regime. a. Requirement that Property be “Owned” by Decedent. Some property, while satisfying the requirement that it be “acquired from the decedent,” will not satisfy the requirement that the property have been “owned” by the decedent at his death. For example, the interest of a surviving spouse in a QTIP trust will be acquired from the surviving spouse, but will not be considered as being owned by that spouse. Similarly, property owned in joint tenancy may not qualify for the full basis adjustment. IRC §1022(d)(1)(A). i. Property Owned Jointly With Surviving Spouse. One half of such property would be eligible for the basis adjustment. IRC §1022(d)(1)(B)(i)(I). ii. Property Owned Jointly With Nonspouse. Basis adjustment permissible to the extent consideration furnished by decedent. IRC §1022(d)(1)(B)(i)(II). b. Ineligible Property. Property acquired by the decedent within three years of death for less than adequate and full consideration will not qualify for a basis adjustment. IRC §1022(d)(1)(C)(i). i. Rule Not Applicable to Gifts Between Spouses. However, property acquired from a spouse for no consideration will qualify, provided the spouse did not acquire the property for less than adequate or full consideration. IRC §1022(d)(1)(C)(ii). c. Allocation of Basis Permitted to Increase Basis of Some Assets. To temper the harshness of the new rule, Congress provided that the executor may allocate (i) up to $1.3 million to increase the basis of assets, and (ii) up to $3 million to increase the basis of assets passing to a surviving spouse, either outright or in a QTIP trust. Although constitutional arguments could be made against the retroactive repeal of the new carryover basis provisions, few would likely object, since it is difficult to envision a situation in which the new carryover basis provision could benefit an estate. i. $1.3 Million Basis Adjustment. This adjustment is increased by loss carryovers and unused losses. Decedents who are nonresidents and noncitizens can claim only a $60,000 basis adjustment and cannot benefit from unused losses or carryover losses. This adjustment can be claimed for assets passing to anyone. ii. $3 Million Basis Adjustment. Applies only to property passing either outright or in a QTIP trust (income payable no less frequently than annually) to surviving spouse. However, property passing to surviving spouse is also eligible for $1.3 million basis adjustment. Therefore, a total of $4.3 million be allocated to property passing to surviving spouse. d. Note that (i) the increase in basis provision references the basis of the asset, not its fair market value and (ii) more estates with highly apprciated assets will be affected by the carryover basis provision in 2010 (if not retroactively repealed) than would have incurred estate tax with a $3.5 million applicable exclusion amount. e. Procedure for Making Basis Allocation. The Conference Report states that the basis allocation is to be done on an asset-by-asset basis by the Executor (or trustee of a revocable trust). vii. Any other information that the regulations may require. (1) Note: The Executor must also furnish to each property recipient a statement giving similar information. IRC §6018(e). (2) Applicable Penalties. Failure to report to the IRS noncash transfers of over $1.3 million or certain transfers within three years of death may incur a penalty of $10,000 for each failure to report. IRC §6018(b)(2). Falure to report to beneficiaries may result in a penalty of $50 for each failure. IRC §6716(b). If the failure to file with the IRS or report to a beneficiary occurred by reason of an intentional disregard of the rule, a penalty equal to 5 percent of the fair market value of the property will be imposed. IRC §6716(d). However, no penalty will be imposed if there is reasonable cause. IRC §6716(c). h. Estate Tax “Shadow” Continues to Apply in Various Situations. Even in 2010, the estate tax has some residual applicability. For example, the tax on distributions from qualified domestic trusts to noncitizen spouses continues for 10 years. Various recapture provisions, including those for installment payment of estate tax (IRC § 6166) and special use valuations, applies in 2010.
iv. any other property passing by reason of the death of the decedent without consideration(e.g., property held in joint tenancy). IRC §1022(e). a. Estate Tax Will Return January 1, 2011. The estate tax will return no later than January 1, 2011. At that time, the exemption amount may be only $1 million (if Congress fails to do anything), or it could be between $3 million and $5 million. As seen, under many current wills, if either spouse were to die in 2010 at a time when there is no estate tax, or when the applicable exclusion amount if high, the credit shelter trust could be overfunded. Overfunding of the credit shelter trust might also result in unintended New York state estate tax consequences, since the New York state estate tax exemption amount is only $1 million. b. Exploit Estate Tax Uncertainty by Utilizing QTIP Trusts. One interesting approach discussed at the University of Miami Heckerling Institute on Estate Planning in Orlando during the week of January 25th, 2010 seeks to exploit the uncertainty in the estate tax in 2010 by maximizing dispositions to QTIP trusts. i. No Election QTIP Trust May be Beneficial. Assets in a QTIP trust with respect to which no estate tax marital deduction is allowed at the death of the first spouse will not be includible in the estate of the surviving spouse under IRC § 2044. If no estate tax exists at the death of the first spouse in 2010, and all of the estate is left to a QTIP trust, no QTIP election will be necessary to save estate taxes on the first spouse to die. If no QTIP election is made, none of the assets in the QTIP trust will be included in the estate of the surviving spouse, even if the estate tax is reenacted prior to the death of the surviving spouse. (1) Why No Inclusion in Estate of Surviving Spouse. The rights accorded to a surviving spouse in a QTIP trust are insufficient to pull the QTIP trust assets back into the her estate under IRC § 2036. QTIP assets are includable only if the executor of the first spouse to die makes a QTIP election and deducts the value of the assets from the gross estate of the first spouse. By making the election, the executor is agreeing to include the value of the assets in the estate of the second spouse at their fair market value at the death of the surviving spouse. If no QTIP election is made, QTIP trust assets will not be included in the estate of the surviving spouse. c. Outright Bequest May be Inferior to QTIP Bequest. In contrast, if all of the assets are instead left outright to the surviving spouse, those assets would be included in the estate of the surviving spouse if the estate tax were reenacted prior to the death of the surviving spouse. Therefore, a QTIP trust may effectively shield the estate of the surviving spouse from potential estate tax liability. The QTIP trust may also impart a significant degree of asset protection into the inherited assets, when compared to an outright bequest. Another advantage to funding the QTIP trust is to ensure that the $3 million spousal basis adjustment can be utilized, if needed. By inserting a disclaimer provision in the will, the surviving spouse could decide whether to disclaim amounts not needed for the $3 million spousal basis adjustment. d. Separate State QTIP Election Previously Not Available. One New York State estate tax problem in connection with generously funding a QTIP was recently resolved by the New York State Department of Finance in a manner beneficial to New York residents. Previously, New York had not recognized a “state-only” QTIP election. That is, if no QTIP election were made on the 706 (and no election would be made in 2010 since none is needed to eliminate the federal tax in 2010), no separate New York QTIP election was possible. i. Separate NYS QTIP Election Now Possible. Taxation and Finance Office of Tax Policy Analysis Taxpayer Guidance Division TSB-M-10(1)M, issued early in 2010, now provides that a QTIP Election for New York State purposes when no Federal Return is Required. (1) Explanation. In certain cases, an estate is required to file a return for New York State estate tax but is not required to file a federal return. This may occur if there is no federal estate tax in effect on the decedent’s date of death or if the decedent died while the federal estate tax was in effect but the value of his or her gross estate was too low to require the filing of a federal estate tax return. In either instance, and if applicable, the estate may still elect to take a marital deduction for Qualified Terminal Interest Property (QTIP) on a pro-forma federal estate tax return that is attached to the New York State estate tax return. (2) Election Made on Pro-Forma Federal Estate Tax Return. For dates of death on or after February 1, 2000, the New York State estate tax conforms to the federal Internal Revenue Code of 1986 (IRC) including all amendments enacted on or before July 22, 1998. Because the IRC in effect on July 22, 1998, permitted a QTIP election o be made for qualifying life estates for a surviving spouse (see IRC § 2056(b)(7)), that election may be made for purposes of a decedent’s New York State estate tax return even if a federal return is not required to be filed. If no federal return is required, the election must be made on the pro-forma federal estate tax return attached to the New York State return. As provided in IRC § 2056(b)(7), once made, this election is irrevocable. In addition, the value of the QTIP property for which the election is made must be included in the estate of the surviving spouse. See IRC § 2044 and New York Tax Law § 954. (3) Procedure for Making Election. The QTIP election is made for New York State estate tax purposes in the same manner as the election would have been made for federal estate tax purposes. Enter the amount of the deduction in Part A1 on Schedule M of federal Form 706, United States Estate (and Generation-Skipping Transfer) Tax Return, for the applicable date of death and complete the rest of the schedule. (4) Federal estate tax return for 2010 dates of death. If there is no federal estate tax for 2010 dates of death and an estate is required to file an estate tax return with New York State, use the federal return for 2009 dates of death, Form 706 (Rev. 9-2009) for the pro-forma federal estate tax return. NOTE FROM NYS-DTF: A TSB-M is an informational statement of existing department policies or of changes to the law, regulations, or department policies. It is accurate on the date issued. Subsequent changes in the law or regulations, judicial decisions, Tax Appeals Tribunal decisions, or changes in department policies could affect the validity of the information presented in a TSB-M.
e. QTIP Funded When No Federal Estate Tax. If all assets of the estate of a decedent dying in 2010 when there is no federal estate tax are transferred to a QTIP trust for which no QTIP election is made, there will be no federal estate on the death of the first spouse since there is no estate tax in 2010, and no federal estate tax on the death of the second spouse – whether or not there is a federal estate tax – since there was no QTIP election. However, there may be a New York state estate tax on the size of the entire estate, less $1 million. (Amounts funding the QTIP trust would qualify for New York’s $1 million lifetime exemption amount, since it would be treated for New York estate tax purposes as funding a garden variety credit shelter trust. A taxable estate (i.e., gross estate less $1 million NYS credit amount) would generate $99,600 in New York State estate tax. i. Outright Disposition Eliminates NYS Tax on Death of First Spouse. Although the New York state estate tax could be avoided by making an outright disposition to the surviving spouse in 2010, this would result an avalanche of potential future federal estate taxes on the death of the surviving spouse, unless of course, the surviving spouse also dies before 2011, or consumes or gifts the entire amount before her death. f. QTIP Disposition May Make Gifting More Costly. Another peculiar disadvantage to funding the QTIP trust with all of the estate assets, rather than leaving assets directly to the children, is that the surviving spouse will incur taxable gifts if lifetime transfers to children are desired. That is, the surviving spouse may not wish to wait until her will takes effect to transfer wealth to children. Recall that although the estate tax has been repealed, the federal gift tax exemption remains at $1 million in 2010 (NYS has no gift tax). The rate of tax applied to gifts has been reduced, however, from 45 percent to 35 percent. i. QTIP Disposition May Make Gifting More Difficult. As will be seen in Part [x], below, assets in a QTIP trust may be more difficult to gift. g. Problem with Disclaimers. Although a disclaimer creates post-mortem flexibility, a significant disadvantage to disclaimers is that the surviving spouse must actually disclaim. Some surviving spouses may not disclaim, even if sensible from a tax standpoint. (4) the trustee or “trust protector” might be given authority to make discretionary distributions to the spouse of as much of the income or principal of the trust as the trustee or trust protector believes is in the best interest of the spouse. The credit shelter trust could also provide that the spouse would no longer be a beneficiary if the spouse were to remarry. ii. Problems with “Solution”. Giving the spouse more rights in a credit shelter trust may eliminate the need to rely on a disclaimer. However, this solution would result in significantly less flexibility, and would almost certainly result in New York state estate tax on the death of the first spouse. Again, the only way to avoid New York estate tax on the death of the first spouse is to make a transfer qualifying for the New York state estate tax deduction. This type of transfer could be (i) an outright transfer to the surviving spouse; (ii) a QTIP transfer for which a QTIP election is made on the 706; or (iii) a general power of appointment trust. A final disadvantage to foregoing the QTIP in favor of a credit shelter trust is that as indicated above, only outright transfers or transfers for a QTIP trust are eligible for the $3 million basis allocation at the death of the first spouse. h. Effect of Surviving Spouse Leaving NYS. Assume a valid QTIP election is made on a New York estate tax return, but the surviving spouse is no longer a resident of New York at her death and the trust has no nexus to New York. Will New York seek to “recoup” the estate tax deduction claimed on the first spouse to die in a manner similar to the way in which California’s “clawback” tax recoups deferred tax in a like-kind exchange if out-of-state replacement property is later sold? Apparently not, provided the surviving spouse is a bona fide nonresident of New York at her death. Would the state in which the surviving spouse dies have a right to tax the assets in the QTIP trust? Also, probably not. Generally, a QTIP trust is not includible under IRC §2036 in the estate of the surviving spouse if no QTIP election is made. Although in this situation a QTIP election would have been made in New York, no QTIP election would have been made in the state in which the surviving spouse had died. Therefore, that state would appear to have no basis to impose estate tax on the assets in the QTIP trust. i. Inheritance Tax Issue. Note, however, that if the state in which the surviving spouse dies imposes an inheritance tax (such as that imposed by Pennsylvania) then this tax would not be avoided, since an inheritance tax is imposed on the transferee, rather than on the estate. 4. Gift Tax Planning in 2010.
a. Congress Limits Lifetime Gifts to $1 Million. Many taxpayers wish to transfer assets to their children during their lifetimes rather than at their death. Therefore, lifetime transfer planning remains important for reasons wholly independent from the fate of the estate tax. While the $1 million lifetime gift tax exclusion amount is a hindrance to large gratuitous transfers, gifts of interests in discounted family entities, installment sales to grantor trusts, and transfers to annuity trusts can significantly leverage the $1 million gift tax exclusion amount. i. Annual Exclusion Amount Remains at $13,000. The gift tax annual exclusion amount remains for 2010 remains at $13,000. Much wealth can be transferred without gift or estate tax consequences by prudent use of annual exclusion gifts, either outright or in trusts providing Crummey powers. It is unlikely that new IRC §2511(c) would operate to invalidate annual exclusion gifts made under IRC §2503 to non-grantor trusts. b. Rate of Tax For Lifetime Gifts Now 35 Percent. The federal gift tax rate (New York has no gift tax) for gifts made in 2010 and thereafter is 35 percent, down from 45 percent. Although the 35 percent rate is not scheduled to increase in 2011, Congress has historically imposed the same rate of tax on both gifts and estates. Since the 35 percent gift tax rate may prove to be only temporary, large gifts of $1 million or more made in 2010 may be considerably less expensive than the same gifts would be in 2011.
c. Obama Administration May Seek to Curtail Valuation Discounts. Another important reason to consider transfer planning in 2010 is that President Obama seeks to curtail valuation discounts, either by means of new legislation, or by issuing regulations under IRC §2704. This prospect, in combination with the historically low gift tax rates now in effect, makes transfer planning in 2010 particularly attractive. d. Will Treasury Move Independently if Congress Fails to Act? Although the IRS has been successful in challenging gift and estate valuation discounts with arguments premised on IRC §2036, IRC §2704(b) has rarely aided the IRS in litigation in the twenty years since its enactment. Treasury’s 2010 budget proposal includes a provision that would expand the scope of IRC §2704(b). Pursuant to its statutory authority to promulgate regulations with respect to restrictions that have the effect of reducing the value of a transferred interest for tax purposes, but without reducing the value of the interest to transferees, the IRS may move independently of Congress. Although any proposed regulations are subject to public comment and may not be released in final form 18 months, under IRC §7805(b)(2), the final regulations issued within that time can be made be retroactive to the date of enactment. e. Window of Opportunity in 2010: There appears to be a reasonable likelihood that either the White House or the IRS will act to make it more difficult to claim valuation discounts with family entities. This creates a “window of opportunity” for gift tax planning with valuation discounts in 2010.
f. New Regulations Under IRC § 2704 Imminent? (1) Capital Accounts. When interests in discounted family entities are gifted, the gift tax value will be less than the net asset value of the property transferred. Nevertheless, the capital account of the donor under IRC § 704(b) is transferred to the donee. When interests in discounted family entities are sold,the fair market value for purposes of computing the (discounted) selling price will be less than the net asset value. In this case, the seller’s capital account under IRC §704(b) will be transferred to the purchaser. g. Valuation Discounts for Co-Tenants. If new regulations are promulgated restricting the ability of taxpayers to claim valuationdiscounts when making gifts of interests in family entities, there may be a trend to capitalize on discounts available for undivided interests in real estate. Thus, if co-tenants by the entirety possess rights under state law to partition property, the IRS may recognize discounts in the range of 15 percent to 30 percent. See Estate of Barge v. Com’r, T.C. Memo 1997-188 (26% discount recognized for undivided interest in timber). h. Discounts for Undivided Interests in Tangible Personal Property Problematic. Estate of Stone, 103 AFTR2d 2009-1379 (9th Cir. 2009) allowed only a 5 percent discount for an undivided 50% interest in an art collection. i. Lifetime Gifts Reduce NYS Estate Tax. Since New York imposes estate tax, but not gift tax, large gifts of cash or unappreciated assets by a person gravely ill can save considerable New York estate tax. While gifts of appreciated assets will also result in New York estate tax savings, such gifts will forfeit the basis step up which would otherwise occur at death. i. Purpose of Power of Attorney. Lifetime gifts by those gravely ill pose unique problems. Gifts made under a power of attorney under New York’s revised law may lessen those problems. A power of attorney is invaluable should the principal later become incapacitated, since the appointment of a legal guardian, who can also make those decisions, requires plenary court proceedings. A power of attorney grants an agent appointed by the principal the authority to make legally binding decisions on the principal’s behalf. ii. Lifetime Gifts Under Revised GOL §5-1501. Although gravely ill persons will rarely have the capacity to make large gifts, another avenue for such gifts opened on September 1, 2009. Effective 9/1/09, NY General Obligations Law §5-1501, which governs the content and execution of powers of attorney, was revised and amended. Powers executed prior this date remain valid, but are subject to the amended statute. iii. Operation of Revised GOL §5-1501. Under the revised law, the power of attorney must be signed, dated and acknowledged not only by the principal, but also by the agent. Under the new law, a power of attorney is durable (i.e., not affected by later incapacity) unless it specifically provides otherwise. If a guardian is later appointed, the agent will account to the guardian rather than to the principal. The new POA contains an optional provision whereby the principal can appoint a “monitor” who may request records of transactions by the agent. The statute also provides for a special proceeding to compel an agent to produce records of receipts. Provisions relating to health care billing should allow the agent access to health care records in accordance with HIPPA privacy requirements. (1) Statutory Major Gifts Rider. A new “Statutory Major Gifts Rider” (SMGR), if executed multaneously with the power of attorney, authorizes the agent to make legally binding major gifts on behalf of the principal. The SMGR must be executed simultaneously with the power of attorney, and with the same formalities governing the execution of a Will. The SMGR may also authorize the agent to “create, amend, revoke, or terminate an inter vivos trust.” The authority of the agent to create joint accounts or to modify a “Totten trust” may also be included in the SMGR. Small gifts ($500 or less) in a calendar year may be made by the agent without a SMGR. The SMGR may be modified to supplement or eliminate the default provisions provided by new law, provided they are not inconsistent with the default SMGR provisions. A conveyance of real property to a bona fide purchaser for less than adequate consideration would require a SMGR, since the conveyance would be in part a gift. (2) Banks Must Now Accept Short Form Power of Attorney. Under GOL §5-1504, acceptance of the statutory “short form” POA by banks and other third parties is now mandatory. A third party may not refuse to honor the power or SMGR without reasonable cause. The statute provides that it is unreasonable for a third party or bank to require its own form, or to object to the form because of the lapse of time between execution and acknowledgment. (Banks had sometimes insisted that their own powers be used, which created a problem where the principal had become incapacitated.) An attorney may certify that a photocopy of a duly executed power is a true copy, and banks must now accept that copy. (3) Statute Clarifies Fiduciary Obligation. The statute requires that the agent, a fiduciary, observe a “prudent person standard of care,” and imposes liability for breaches of fiduciary duty. Fiduciary duties are imposed on agents appointed under all powers of attorney, including those executed prior to the effective date of the new law. The agent must maintain records and must make those records available within 15 days to a monitor, co-agent, certain governmental entities, a court evaluator, a guardian, or a representative of the principal’s estate. The statute expressly provides that the agent is entitled to compensation for his work. A mechanism is provided by which the agent may resign. j. Treasury Proposes that Taxpayers be Bound by Gift or Estate Tax Values. Treasury has also proposed that taxpayers who receive property by gift or by bequest from a decedent must use the gift or estate tax value for future income tax purposes, even if they disagree with that value. Thus, a taxpayer who receives property from a decedent would be required to use as his basis that reported for estate tax purposes. Similarly, a taxpayer receiving property by gift would be required to use the donor’s basis as reported for gift tax purposes. k. New Actuarial Tables. Treasury announced new actuarial tables to reflect increased longevity. The new tables increase the value of lifetime interests and decrease the value of remainders or reversionary interests. T.D. 9448. 5. Use of Disclaimers in Estate Planning. a. Introduction. Disclaimers can be extremely useful in accomplishing pre-mortem and especially post-mortem, estate planning. A person who disclaims property is treated as never having received the property for gift, estate or income tax purposes. This is significant, since the actual receipt of the same property followed by a gratuitous transfer would otherwise result in a taxable gift. Although Wills frequently contain express language advising a beneficiary of a right to disclaim, such language is largely gratuitous, since a beneficiary may always disclaim. b. Disclaimer Must be a “Qualified Disclaimer” Under IRC § 2518. For a disclaimer to achieve the intended federal tax result, it must constitute a “qualified disclaimer” under IRC §2518. If the disclaimer is not a qualified disclaimer, the disclaimant is treated as having received the property and then having made a taxable gift. Treas. Regs. §25.2518-1(b). Under the EPTL, as well as under the law of most states, the person disclaiming is treated as if he had predeceased the donor, or died before the date on which the transfer creating the interest was made. Neither New York nor Florida is among the ten states which have adopted the Uniform Disclaimer of Property Interests Act (UDPIA). c. Qualified Disclaimer Requirements. For a disclaimer to be qualified under IRC § 2518, the disclaimer must (A) be irrevocable and unqualified; (B) be in writing, identify the property disclaimed and be signed by the disclaimant or by his legal representative; (C) be delivered to either the transferor or his attorney, the holder of legal title, or the person in possession; (D) be made within 9 months of the date of transfer or, if later, within 9 months of the date when the disclaimant attains the age of 21; (E) be made at a time when the disclaimant had not accepted the interest disclaimed or enjoyed any of its benefits; and (F) be valid under state law, so that it passes to either the spouse of the decedent or to a person other than the disclaimant without any direction on the part of the person making the disclaimer. Under EPTL § 2-1.11(f) the right to disclaim may be waived if in writing. i. With respect to (A), PLR 200234017 stated that a surviving spouse who had been granted a general power of appointment had not made a qualified disclaimer of that power by making a QTIP election on the estate tax return, since the estate tax return did not evidence an irrevocable and unqualified refusal to accept the general power of appointment. ii. With respect to (C), copies of the disclaimer must be filed with the surrogates court having jurisdiction of the estate. If the disclaimer concerns nontestamentary property, the disclaimer must be sent via certified mail to the trustee or other person holding legal title to, or who is in possession of, the disclaimed property. iii. With respect to (D), it is possible that a disclaimer might be effective under the EPTL, but not under the Internal Revenue Code. For example, under EPTL §2-1.11(a)(2) and (b)(2), the time for making a valid disclaimer may be extended until “the date of the event by which the beneficiary is ascertained,” which may be more than 9 months of the date of the transfer. In such a case, the disclaimer would be effective under New York law but would result in a taxable gift for purposes of federal tax law. iv. With respect to (E), consideration received in exchange for making a disclaimer would constitute a prohibited acceptance of benefits under EPTL §2-1.11(f). v. With respect to (F), EPTL §2-1.11(g) provides that a beneficiary may accept one disposition and renounce another, and may renounce a disposition in whole or in part. One must be careful to disclaim all interests, since the disclaimant may also have a right to receive the property by reason of being an heir at law, a residuary legatee or by other means. In this case, if disclaimant does not effectively disclaim all of these rights, the disclaimer will not be a qualified disclaimer with respect to the portion of the disclaimed property which the disclaimant continues to have the right to receive. IRC §2518-2(e)(3). (1) Exception to Rule for Spousal Disclaimers. An important exception to this rule exists where the disclaimant is the surviving spouse: In that case the disclaimed interest may pass to the surviving spouse even if she is the disclaimant. Treas. Reg. §25.2518-2(e); EPTL §2-1.11(e). d. Disclaimer Under Federal Law Where None Possible Under State Law. IRC § 2518(c) provides for what is termed a “transfer disclaimer.” The statute provides that a written transfer which meets requirements similar to IRC § 2518(b)(2) (timing and delivery) and IRC § 2518(b)(3) (no acceptance) and which is to a person who would have received the property had the transferor made a qualified disclaimer, will be treated as a qualified disclaimer for purposes of IRC §2518. The usefulness of IRC § 2518(c) becomes apparent in cases where federal tax law would permit a disclaimer, yet state law would not. e. Uses of Qualified Disclaimers. i. Charitable Deductions. Treas. Reg. § 20.2055-2(c) provides that a charitable deduction is available for property which passes directly to a charity by virtue of a qualified disclaimer. If the disclaimed property passes to a private foundation of which the disclaimant is an officer, he should resign, or at a minimum not have any power to direct the disposition of the disclaimed property. The testator may wish to give family members discretion to disclaim property to a charity, but yet may not wish to name the charity as a residuary legatee. In this case, without specific language, the disclaimed property would not pass to the charity. To solve this problem, the will could provide that if the beneficiary disclaims certain property, the property would pass to a specified charity. ii. Marital Disclaimers. Many wills contain “formula” clauses which allocate to the credit shelter trust — or give outright — the maximum amount of money or property that can pass to beneficiaries (other than the surviving spouse) without the imposition of federal estate tax. If the applicable exclusion amount is high, situations will arise where the surviving spouse may be disinherited if the beneficiaries of the credit shelter trust do not renounce part of their interest under such a formula clause. If such an interest is disclaimed and it passes to the surviving spouse, it will qualify for the marital deduction. (1) Renunciation by Spouse to Create QTIP Trust. Another use of the disclaimer in a similar situation is where either the surviving spouse or a trustee renounces a power of appointment so that the trust will qualify as a QTIP trust. (a) Illustration. A surviving spouse who is granted a general power of appointment over property intended to qualify for the marital deduction under IRC § 2056(b)(5) may disclaim the general power, thereby enabling the executor to make a partial QTIP election. This ability to alter the amount of the marital deduction allows the executor to finely tune the credit shelter amount. If both spouses die within 9 months of one another, a qualifying disclaimer by the estate of the surviving spouse can effect an equalization of estates, thereby reducing or avoiding estate tax. iii. Spousal Disclaimer of Right to Income From Credit Shelter Trust. Consider the effect of qualified disclaimer executed within nine months by a surviving spouse of her lifetime right to income from a credit shelter trust providing for an outright distribution to the children upon her death. If, within nine months of her spouse’s death, the surviving spouse decides that she does not need distributions during her life from the credit shelter trust, she disclaims, she will treated as if she predeceased her husband. If the will of the predeceasing spouse provides for an outright distribution of the estate to the children if wife does not survive, then the disclaimer will have the effect of enabling the children to receive the property that would have funded the credit shelter trust at the death of the first spouse. iv. Disclaimer of Jointly Held Property to Achieve Basis Step Up. Assume the surviving spouse paid no consideration for certain property held jointly with her predeceasing spouse. If she dies within 9 months and her estate disclaims, then the property would pass through the predeceasing spouse’s probate estate. In that case, a full basis step up would become available. If the property would then pass to the surviving spouse under the will of the predeceasing spouse, this planning technique becomes invaluable, as it creates a stepped up basis for assets which would not otherwise receive such a step up if the disclaimer were not made. v. Disclaimer to Create Taxable Estate in Predeceasing Spouse. A qualifying disclaimer executed by the surviving spouse may also enable the predeceasing spouse to fully utilize the applicable exclusion amount. For example, assume the will of the predeceasing spouse leaves the entire estate of $10 million to the surviving spouse (and nothing to the children). Although the marital deduction would eliminate any estate tax liability on the estate of the first spouse to die, the eventual estate of the surviving spouse would likely have an estate tax problem. By disclaiming $3.5 million, the surviving spouse would create a taxable estate in the predeceasing spouse, which could then utilize the full applicable exclusion amount of $3.5 million. The taxable estate of the surviving spouse would be reduced to $6.5 million. (1) To refine this example, the will of the first spouse to die could provide that if the surviving spouse disclaims, the disclaimed amount would pass to a family trust of which the surviving spouse has a lifetime income interest. The will could further provide that if the spouse were also to disclaim her interest in the family trust, the disclaimed property would pass as if she had predeceased. vi. Disclaiming Power to Remove Trustee. The grantor may wish to ensure that the named trustee will be liberal in making distributions to his children. By giving the child beneficiary the unrestricted right to remove the trustee, this objection can be achieved. However, if the child has the ability to remove the trustee, and the trust grants the trustee the power to make distributions to the child that are not subject to an ascertainable standard, this may cause problems, since the IRS may impute to the child a general power of appointment. If the IRS were successful in this regard, the entire trust might be included in the child’s taxable estate. To avoid this result, the child could disclaim the power to remove the trustee. This might, of course, not accord with the child’s nontax wishes. (1) Disclaimer of “Five and Five” Power. If a surviving spouse is given a “five and five” power over a credit shelter or family trust, 5 percent of the value of the trust will be included in her estate under IRC §2041. However, if the surviving spouse disclaims within 9 months, nothing will be included in her estate. vii. Disclaimer to Eliminate a Trust. At times, all beneficiaries may agree that it would be better if no trust existed. If all current income trust beneficiaries, which might include the surviving spouse and children, disclaim, the trust may be eliminated. In such a case, the property might pass to the surviving spouse and the children outright. Note that if minor children are income beneficiaries, their disclaimers could require the consent of guardians ad litem. viii. Disclaimers in Medicaid, Creditor & Bankruptcy. Under New York law, if one disclaims, and by reason of such disclaimer that person retains Medicaid eligibility, such disclaimer may be treated as an uncompensated transfer of assets equal to the value of any interest disclaimed. This could impair Medicaid eligibility. In some states, if a disclaimer defeats the encumbrance or lien of a creditor, it may be alleged that the disclaimer constitutes a fraudulent transfer. Not so in New York and California, where a disclaimer may be used to defeat the claim of a creditor. In Florida, the result in contra: A disclaimer cannot prevent a creditor from reaching the disclaimed property. ix. Disclaimers and the IRS. Will a qualified disclaimer defeat a claim of the IRS? No. Prior to a Supreme Court ruling, there had been a split in the circuits. The 2nd Circuit in United States v. Camparato, 22 F3d. 455, cert. denied, 115 S.Ct. 481 (1994) held that a federal tax lien attached to the “right to inherit” property, and that a subsequent disclaimer did not affect the federal tax lien under IRC §6321. The Supreme Court, in Drye v. United States, 528 U.S. 49 (1999), adopted the view of the Second Circuit, and held that the federal tax lien attached to the property when created, and that any subsequent attempt to defeat the tax lien by disclaimer would not eliminate the lien. x. Effect of Disclaimer on Bankruptcy Petition. Bankruptcy courts have generally reached the same result as in Drye. The disclaimer of a bequest within 180 days of the filing of a bankruptcy petition has in most bankruptcy courts been held to be a transfer which the trustee in bankruptcy can avoid. Many courts have held that even pre-petition disclaimers constitute a fraudulent transfer which the bankruptcy trustee can avoid. If the Drye rationale were applied to bankruptcy cases, it would appear that pre-petition bankruptcy disclaimers would, in general, constitute transfers which the bankruptcy trustee could seek to avoid. However, at least one court, Grassmueck, Inc., v. Nistler (In re Nistler), 259 B.R. 723 (Bankr. D. Or. 2001) held that Drye relied on language in IRC §6321, and should be limited to tax liens. (1) Similarly, a qualified disclaimer for purposes of IRC §2518 will not result if the disclaimant has accepted the interest or any of its benefits prior to making the disclaimer. Treas. Regs. §25.2518-2(d)(1) states that acts “indicative” of acceptance include (i) using the property or interest in the property; (ii) accepting dividends, interest, or rents from the property; or (iii) directing others to act with respect to the property or interest in the property. However, merely taking title to property without accepting any benefits associated therewith does not constitute acceptance. Treas. Regs. §25.2518-2(d)(1). Nor will a disclaimant be considered to have accepted benefits merely because under local law title to property vests immediately in the disclaimant upon the death of the decedent. Treas. Regs. §25.2518-2(d)(1). (2) Rule Liberally Construed. The acceptance of benefits of one interest in the property will not, alone, constitute an acceptance of any other separate interests created by the transferor and held by the disclaimant in the same property. Treas. Regs. §25.2518-2(d)(1). Thus, TAM 8619002 advised that surviving spouse who accepted $1.75x in benefits from a joint brokerage account effectively disclaimed the remainder since she had not accepted the benefits of the disclaimed portion which did not include the $1.75x in benefits which she had accepted. (3) Continued Residence by Joint Tenant Not a Bar to Disclaimer. The disclaimant’s continued use of property already owned is also not, without more, a bar to a qualifying disclaimer. Thus, a joint tenant who continues to reside in jointly held property will not be considered to have accepted the benefit of the property merely because she continued to reside in the property prior to effecting the disclaimer. Treas. Regs. §25.2518-2(d)(1); PLR 9733008.
ii. Testamentary Power of Appointment. Rule with Power of AppoThe existence of an exercised general power of appointment in a will before the death of the testator is not an acceptance of benefits. Treas. Regs. §25.2518-2(d)(1). However, if the powerholder dies having exercised the power, acceptance of benefits has occurred. TAM 8142008.
iii. Possibility of Future Consideraton Not a Bar to Disclaimer. The receipt of consideration in exchange for exercising a disclaimer constitutes an acceptance of benefits. However, the mere possibility that a benefit will accrue to the disclaimant in the future is insufficient to constitute an acceptance. Treas. Regs. §25.2518-2(d)(1); TAM 8701001. Actions taken in a fiduciary capacity by a disclaimant to preserve the disclaimed property will not constitute an acceptance of benefits. Treas. Regs. §25.2518-2(d)(2). g. Disclaimer of Separate Interests. A disclaimant may make a qualified disclaimer with respect to all or an undivided portion of a separate interest in property, even if the disclaimant has another interest in the same property. Thus, one could disclaim an income interest while retaining an interest in principal. PLR 200029048. So too, the right to remove a trustee was an interest separate from the right to receive principal or a lifetime special power of appointment. PLR 9329025. PLR 200127007 ruled that the benefit conferred by the waiver of the right of recovery under IRC §2207A would constitute a qualified disclaimer. h. Disclaimer of Severable Interests. A disclaimant makes a qualified disclaimer with respect to disclaimed property if the disclaimer relates to severable property. Treas. Regs. §25.2518-3(a)(1)(ii). Thus, (i) the disclaimer of a fractional interest in a residuary bequest was a qualified disclaimer (PLR 8326033); (ii) a disclaimer may be made of severable oil, gas and mineral rights (PLR 8326110); and (iii) a disclaimer of the portion of real estate needed to fund the obligation of the residuary estate to pay legacies, debts, funeral and administrative expenses is a severable interest. PLR 8130127.
i. Disclaimer Must Include Residuary Interests. For disclaimants (other than a surviving spouse) who are residuary legatees or heirs at law, the disclaimant must tbe careful not only to disclaim the interest in the property itself, but also to disclaim the residuary interest. If not, the disclaimer will not be effective with respect to that portion of the interest which the disclaimant has the right to receive. §25.2518-2(e)(3). To illustrate, in PLR 8824003, a joint tenant (who was not a surviving spouse) was entitled to one-half of the residuary estate. The joint tenant disclaimed his interest in the joint tenancy, but did not disclaim his residuary interest. The result was that only half of the disclaimed interest qualified under IRC §2518. The half that passed to the disclaimant as a residuary legatee did not qualify. j. Disclaimant’s Retained Powers. The disclaimant may not have the power, either alone or in conjunction with another, to determine who will receive the disclaimed property, unless the power is subject to an ascertainable standard. However, with respect to a surviving spouse, the rule is more lax. Estate of Lassiter, 80 T.C.M. (CCH) 541 (2000) held that Treas. Reg. §25.2518-2(e)(2) does not prohibit a surviving spouse from retaining a power to direct the beneficial enjoyment of the disclaimed property, even if the power is not limited by an ascertainable standard, provided the surviving spouse will ultimately be subject to estate or gift tax with respect to the disclaimed property. i. Disclaimant May Not Have Retained Fiduciary Powers. An impermissible power of direction exists if the disclaimant has a power of appointment over a trust receiving the disclaimed property, or if the disclaimant is a fiduciary with respect to the disclaimed property. §25.2518-2(e)(3). However, merely precatory language which is not binding under state law as to who shall receive the disclaimed property will not constitute a prohibited “direction”. PLR 9509003.
k. Disclaimer of Fiduciary Powers. Limits on the power of a fiduciary to disclaim may have profound tax implications. PLR 8409024 stated that the trustees could disclaim administrative powers the exercise of which did not “enlarge or shift any of the beneficial interests in the trust.” However, the trustees could not disclaim dispositive fiduciary powers which directly affected the beneficial interest involved. This rule limits the trustee’s power to qualify a trust for a QTIP election. l. Disclaimers Made on Behalf of Infants, Minors and Incompetents. In some states, representatives of minors, infants, or incompetents may disclaim without court approval. However, EPTL §2-1.11(c), while permitting renunciation on behalf of an infant, incompetent or minor, provides that such renunciation must be “authorized” by the court having jurisdiction of the estate of the minor, infant or incompetent. In Estate of Azie, 694 N.Y.S.2d 912 (Sur. Ct. 1999), two minor children were beneficiaries of a $1 million life insurance policy of their deceased father. The mother, who was the guardian, proposed to disclaim $50,000 of each child. The proposed disclaimer would fund a marital trust and would save $40,000 in estate taxes. The Surrogate, disapproving of the proposed disclaimer, stated that the disclaimer must be advantageous to the children, and not merely to the parent. m. Timeliness of Disclaimer. Issues may arise where a disclaimer would be valid under the EPTL but not under the Internal Revenue Code. EPTL §2-1.11-(b)(2) provides that a renunciation must be filed with the Surrogates court within 9 months after the effective date of the disposition, but that this time may be extended for “reasonable cause.” EPTL §2-1.11(a)(2)(C) provides that the effective date of the disposition of a future interest “shall be the date on which it becomes an estate in possession.” Since under IRC §2518, a renunciation must be made within 9 months, the grant of an extension by the Surrogates court of the time in which to file a renunciation might result in a valid disclaimer for New York purposes, but not for purposes of federal tax law. Similarly, while the time for making a renunciation of a future interest may be extended under EPTL §2-1.11(a)(2)(C), such an extension would likely be ineffective for purposes of IRC §2518. n. Jointly Owned Property. The rules for disclaiming jointly owned property can generally be divided into two categories: (i) joint bank, brokerage and other investment accounts where the transferor may unilaterally regain his contributions; and (ii) all other jointly held interests. With respect to (i) the surviving co-tenant may disclaim within 9 months of the transferor’s death but, under the current EPTL, only to the extent that the survivor did not furnish consideration. i. With respect to (ii), for all other interests held jointly with right of survivorship or as tenants by the entirety, a qualified disclaimer of the interest to which the disclaimant succeeds upon creation must be made no later than 9 months after the creation. A qualified disclaimer of an interest to which the disclaimant succeeds upon the death of another (i.e., a survivorship interest) must be made no later than 9 months after the death of the first tenant. This is true (i) regardless of the portion of the property contributed by the disclaimant; (ii) regardless of the portion of the property included in the decedent’s gross estate under IRC §2040; and (iii) regardless of whether the property is unilaterally severable under local law. ii. Bill to Conform EPTL to Federal Law. A bill has been introduced in the New York legislature which would conform New York law to federal law. Under current law, EPTL 2-1.11(b)(1) provides that a surviving joint tenant or tenant by the entirety may not disclaim the portion of property allocable to amounts contributed by him with respect to such property. Under the proposed law, the surviving joint tenant or tenant by the entirety may disclaim to the extent that such interest could be the subject of a qualified disclaimer under Section 2518 of the Internal Revenue Code. a. Rationale. Gift and sales transfers are frequently expressed by formula to avoid unexpected adverse gift tax ramifications that could result if the value of the transferred interest is changed during an audit. There are generally two types of formula clauses — (1) value adjustment clauses, and (2) value definition clauses. i. Value Adjustment Clauses. A value adjustment clause provides for either an increase in the price of an asset or a return of a portion of the transferred asset if the value of the transferred asset is determined to be greater than anticipated at the time of the transfer. However, this technique generally does not work. A number of courts have fuled that since it is a condition subsequent which would have the effect of undoing a portion of a gift, it is against public policy and therefore void. ii. Value Definition Clauses. Unlike a value adjustment clause, which attempts to take advantage of a condition subsequent to avoide a transfer in excess of that which is contemplated, a value definition clause defines the value of the gift or sale at the time of the transfer. In a value definition clause, the agreement between the parites does not require a price adjustment or an adjustment in the amount of property transferred, but rather provides that the transaction is complete, but the extent of the property sold or given is not fully known at that time. Therefore, an adjustment on a revaluation bythe IRS will be upheld and will simply cause an adjustment of the interests allocated between the transferor and transferee(s). (b) Formula Allocation Clause. A formula allocation clause allocates the transferred amount among non-taxable transferees, which include charities, QTIP trusts, or outright transfers to spouses. (c) Use of Formula Disclaimer Upheld by 8th Circuit. The Eighth Circuit, in Estate of Christiansen, approved the use of formula disclaimers. __F.3d__, No. 08-3844, (11/13/09); 2009 WL 3789908, aff’’g 130 T.C. 1 (2008). Helen Christiansen left her entire estate to her daughter, Christine, with a gift over to a charity to the extent Christine disclaimed her legacy. By reason of the difficulty in valuing limited partnership interests, Christine disclaimed that portion of the estate that exceeded $6.35 million, as finally determined for estate tax purposes. Following IRS examination, the estate agreed to a higher value for the partnership interests. However, by reason of the disclaimer, this adjustment simply resulted in more property passing to the charity, with no increase in estate tax liability. The IRS objected to the formula disclaimer on public policy grounds, stating that fractional disclaimers provide a disincentive to audit. a. QTIP Election. By making a QTIP election, the Executor will enable the decedent’s estate to claim a full marital deduction. To qualify, the trust must provide that the surviving spouse be entitled to all income, paid at least annually, and that no person may have the power, exercisable during the surviving spouse’s life, to appoint the property to anyone other than the surviving spouse. Since the Executor may request a 6 month extension for filing the estate tax return, the Executor in effect has 15 months in which to determine whether to make the QTIP election. i. Electing QTIP Treatment Not Always Advantageous. Nevertheless, electing QTIP treatment is not always advantageous. Inclusion of trust assets in the estate of the first spouse to die may “equalize” the estates. Equalization may have the effect of (i) utilizing the full exemption amount of the first spouse and (ii) avoiding higher rate brackets that apply to large estates. Still, the savings in estate taxes occasioned by avoiding the highest tax brackets may itself be diminished by the time value of the money used to pay the estate tax at the first spouse’s death. On the other hand, if the second spouse dies soon after the first, a credit under IRC §2013 may reduce the estate tax payable at the death of the surviving spouse. b. Partial QTIP Elections. Although the IRS had at one time litigated the issue, it now appears that the Executor may elect QTIP treatment for only a portion of the trust, with the nonelected portion passing to a credit shelter trust. If a partial QTIP election is anticipated, separating the trusts into one which is totally elected, and second which is totally nonelected, may be desirable. In this way, future spousal distributions could be made entirely from the elected trust, which would reduce the size of the surviving spouse’s estate. c. Right of Estate of Surviving Spouse to Reimbursement. When the surviving spouse dies, QTIP property is included in her estate at the fair market value at the date of her death. Her estate is entitled to be reimbursed for estate taxes paid by recipients of the trust property. The amount of reimbursement is calculated using the highest marginal estate tax brackets of the surviving spouse. The failure to seek reimbursement of estate taxes is treated as gift made to those persons who would have been required to furnish reimbursement. However, the failure by the estate of the surviving spouse to seek reimbursement will not be treated as a gift if the decedent’s will expressly provides that reimbursement will not be sought from QTIP property. d. Defective Election Not Revocable Even if No Benefit Accrues From Election. Care must be taken when making the QTIP election, since the IRS takes the position that if the election taken on the initial federal and state estate tax returns was defective — but the IRS did not notice the defect and allowed the marital deduction — the assets will nevertheless be includible in the estate of the surviving spouse under IRC §2044. Thus, the IRS takes the position that the assets are includible even if the estate of the first spouse would have incurred no estate tax had the QTIP election not been made. See PLR 9446001.
i. Distinguish Unnecessary Election. On the other hand, an unnecessary QTIP election will occasion of fewer harsh results. Under Rev. Proc. 2001-38, an unnecessary QTIP election for a credit shelter trust will be disregarded to the extent that it is not needed to eliminate estate tax at the death of the first spouse. Similarly, a mistaken overfunding of the QTIP trust will not cause inclusion of the overfunded amount in the estate of the surviving spouse. TAM 200223020.
e. QTIP Can Act As Buffer for Bequests Above Applicble Exclusion Amount. Since the estate tax is a “tax inclusive,” as opposed to the gift tax, which is “tax exclusive,” there is a distinct tax benefit to making lifetime, as opposed to testamentary, gratuitous transfers. A QTIP trust can assist in overcoming this problem. Assume at a time when the applicable exclusion amount (AEA) is $3.5 million, father has an estate of $6 million, and mother has an estate of $2.5 million. Father (who has made no lifetime gifts other than annual exclusion gifts) wishes to give his children $4.5 million. If $4.5 million were left to the children outright, the $1 million excess over $3.5 million would attract a federal estate tax of $450,000, and a New York estate tax of approxmiately $160,000, for a total tax of $610,000. This would result in children receiving only $3.89 of the $4.5 million father desired to them. If instead of leaving $4.5 million to his children outright, father were to leave only $3.5 million to them outright and place $1 million in a trust qualifying for a QTIP election, the 60 percent tax on the final $1 million for the children would be avoided. f. Leveraging Applicable Exclusion Amount. Although there must be no prearranged agreement that spouse will make the contemplated transfer of his or her lifetime income interest, it is evident that the gift of a qualifying income interest in a QTIP trust can be an effective means of leveraging the $3.5 million lifetime exemption amount by leaving assets to the surviving spouse, who is then expected — but not required — to make substantial gifts to the children. Note that in the example the intended result would not be accomplished if the spouse simply disclaimed her interest in the QTIP. In that case she would be treated as having predeceased her husband, and the $1 million would again be paid to the children and subject to $610,000 in combined federal and NYS tax. g. Caution: Trust Must Not Restrict Spouse’s Right to Income. The surviving spouse may choose to utilize the trust income for gift tax planning. However, the trust may not require the surviving spouse to utilize the income for any other purpose, as this would constitute an impermissible limitation on the spouse’s unqualified right to income during his or her lifetime. i. Effect of Giving Surviving Spouse Greater Withdrawal Rights. What are the tax ramifications of giving the surviving spouse greater rights with respect to withdrawal of principal? If the spouse is given an unlimited right to withdraw principal, the trust might constitute a general power of appointment trust. While this would preverve the unlimited marital deduction, the right of the decedent to choose who would ultimatley receive the property could be lost. The IRS has ruled, however, that granting the surviving spouse a power to withdraw the greater of 5 percent of trust principal or $5,000 per year (a “five and five” power) would not result in disqualification of QTIP treatment. (1) Caution: If greater rights are giving to surviving spouse under an intended QTIP, but those rights do not rise to the level of a general power of appointment, there is the risk that if the trust no longer qualifies for QTIP treatment, and the trust does not constitute a general power of appointment trust, the marital deduction could be lost. The result would be inclusion in the gross estate of the first spouse to die. ii. Planning if Trust Grants No Right of Surviving Spouse to Withdraw Principal. If the surviving spouse has no right in the trust instrument to withdraw principal, may the trustee make discretionary distributions of principal to further gift planning by the surviving spouse? If the discretionary distributions used for gifting were disallowed by the IRS, this could result in inclusion in the estate of the surviving spouse. The Tax Court, in Estate of Halpern v. Com’r, T.C. Memo. 1995-352, held that discretionary distributions made by the trustee to the surviving spouse, and utilized by her to make gifts were not included in the estate of the surviving spouse, because the trustee had acted reasonably. iii. Planning if Surviving Spouse Has No Withdrawal Rights and Trustee Cannot Make Discretionary Distributions of Principal. What if the surviving spouse has no right to withdraw principal and the trustee cannot make discretionary distributions of principal? Can the surviving spouse still engage in gift planning? Yes. (1) Disposition of Income Interest Under IRC §§ 2511 and 2519. The surviving spouse can make a gift of or release her qualifying income interest in the trust property to which she would otherwise be entitled. This would constitute a garden variety gift under IRC §2511. However, the disposition would also trigger IRC §2519. IRC §2519 provides that “any disposition of all or part of a qualifying income interest for life in any property to which this section applies is treated as a transfer of all interests in the property other than the qualifying income interest.” Therefore, were wife to gift one-half of her qualifying income interest, she would be deemed to have made a gift of the entire remainder interest in trust, in addition to the gift of the income interest. Under IRC §2207A(a), she would have a right to recover gift tax attributable to the deemed transfer of the remainder interest under IRC §2519. (2) Example. IRC §2519 provides that if a surviving spouse disposes of a qualifying income interest in trust property, she is deemed also to have disposed of all interests in that property other than the qualifying income interest. The operation of IRC §2519 is best seen by example. (ii) Under IRC §2207A(b), if the surviving spouse is deemed to have made a gift under IRC §2519, the surviving spouse has a right to seek reimbursement for gift taxes she must pay. Since the value of what the donees receive is reduced by the gift tax they must tender to the surviving spouse, the amount of the gift is reduced by the amount to be reimbursed to the surviving spouse. The gift made by the surviving spouse is termed a “net gift”. 1) Gift Treatment Under Proposed Regs. Proposed regs provide for “net gift” treatment of the deemed gift of a remainder interest under IRC §2519. (A net gift occurs if the donee is required, as a condition to receiving the gift, that he pay any gift taxes associated with the gift.) The gift taxes so paid by the donee may be deducted from the value of the transferred property to determine the donor’s gift tax. Thus, assume the value of each of the income interest and the remainder interest in the QTIP trust are $500,000. If wife makes a gift of one-half of her income interest, or $250,000, she would be deemed to have made a net gift of the entire $500,000 remainder interest. If the gift tax rate were 50%, wife would have made a net deemed gift of the remainder interest constituting $333,333, resulting in a gift tax of $167,667. (b) Problem of Spendthrift Limitations. Although releasing a a qualifying income interest may be a good method of engaging in gift planning where the surviving spouse has no right to make withdrawal of principal and the trustee has no discretion to make such distributions, one must consider the effect of the typical spendthrift limition which appears in most testamentary trusts. Courts have generally held that an income beneficiary of a spendthrift trust cannot assign or alienate an income interest once accepted. See, e.g., Hartsfield v. Lescher, 721 F.Supp. 1052 (E.D. Ark. 1989). Is this the end of the road? Not necessarily. (c) Will Disclaimer Overcome Spendthrift Limitation? Even if the surviving spouse is barred from alienating her income interest by reason of a spendthrift clause limitation, she may still be able to disclaim that interest under New York’s disclaimer statute, EPTL 2-1.11. New York law requires that the disclaimer be made within nine months, but may be extended provided the disclaimant shows “reasonable cause”. (i) To be a qualified disclamier under federal law, the disclaimer must be made within nine months. What result would obtain if the renunciation were made after more than nine months, having been extended by the New York Surrogate for reasonable cause? Clearly, the renunciation would not constitute a qualified disclaimer under IRC §2519. In this case the disclaimer would be termed a “nonqualified disclaimer”. This would be an alternate means of triggering IRC §2519. Again, the aim of triggering IRC § 2519 would be to permit the surviving spouse to engage in gift planning. (1) Statutory Rule is Harsh. The problem with the statute is that if the surviving spouse releases part of her qualifying income interest, she will be treated, under IRC §2519, as having disposed of all trust property. This means that a gift tax would be imposed on all trust property, even though the income interest released by the surviving spouse pertained only to part of the trust property. The harshness of the statutory rule is not justified from a transfer tax standpoint. If the statute required reporting as a gift only that portion of the trust property which related to the qualifying income interest disposed of — which most commentators believe is correct — then the estate of the surviving spouse would include the trust assets not previously reported as a gift. Nevertheless, this is not the case, and a gift of a partial qualifying income interest will in fact trigger the harsh result mandated by IRC §2519, and if no curative measure is found to alter this result, the surviving spouse would be required to report as a gift the entire value of the QTIP trust. (a) IRS Permits Harsh Rule to be Avoided by Severing QTIP. Fortunately, the IRS routinely allows taxpayer to sever QTIP trusts prior to the surviving spouse disposing of a partial income interest in the QTIP. This avoids the harshness of the “transfer of all interests” rule. See PLRs 200438028, 200328015.
v. Pre-Mortem Planning with QTIP Trusts. IRC §2044 requires that remaining QTIP assets be included in the gross estate of the surviving spouse. However, those assets are not aggregated with other assets in the estate of the surviving spouse. Thus, in Estate of Bonner v. U.S., 84 F.3d 196 (5th Cir. 1996) the surviving spouse at her death owned certain interests outright, and others were included in her estate pursuant to IRC §2044. The estate claimed a fractional interest discount, which the IRS challenged. The Fifth Circuit held that assets included in the decedent spouse’s gross estate which were held outright were not to be aggregated with those included under IRC §2044 by virtue of the QTIP trust. Thus, the estate was entitled to take a fractional interest discount. Apparently, even if the surviving spouse were a co-trustee of the QTIP trust, the result would be the same: no aggregation is required. See FSA 200119013.
vi. Estate Planning Possibility under Bonner? Under Bonner, could the trustee of the QTIP trust distribute a fractional share of real estate owned by the QTIP trust in order to generate a fractional interest discount at the death of the surviving spouse? Possibly, but in Bonner, the surviving spouse owned an interest in certain property, and then became the income beneficiary of a QTIP trust which was funded with interests in the same property. The surviving spouse in Bonner already owned a separate interest in the same property. This situation is distinguishable from one in which the QTIP trusts owns all of the interest in a certain piece of property, and then distributes some of that interest to the surviving spouse. In that case, it is less clear that the IRS would not succeed in attempting to aggregate the interests in the same property for the purpose of precluding the estate from claiming a valuation discount. The case would be weaker if the distribution of the fractional interest to the surviving spouse had, as one of its principal purposes, no intention other than to support a later assertion of a fractional interest discount. 8. Sales of Assets to Grantor Trusts. Installment sales of assets to grantor trusts indirectly exploit income tax provisions enacted to prevent income shifting at a time when trust income tax rates were much lower than individual tax rates. Specifically, the technique capitalizes on different definitions of “transfer” for transfer tax and grantor trust income tax purposes. The resulting trusts are termed “defective” because the different definitions of “transfer” result in a serendipitous divergence in income and transfer tax treatment when assets are sold by the grantor to his own grantor trust. i. Transfer for Transfer Tax, but Not For Income Tax, Purposes. For income tax purposes, after an asset sale has occurred, the grantor trust holds property on which the grantor continues to report income tax. However, the grantor is no longer considered as owning the asset for transfer tax purposes, and the trust assets, as well as the appreciation thereon, will be outside of the grantor’s taxable estate. As a result of this odd juxtaposition of income and transfer tax rules, the grantor is taxed on trust income but will have depleted his estate of the value of the assets for transfer tax purposes. ii. Illustration. To illustrate the mechanics, assume the grantor sells property worth $5 million to a trust in exchange for a $5 million promissory note, the terms of which provide for adequate interest payable over 20 years, and one balloon payment of principal after 20 years. If the trust is drafted so that the grantor retains certain powers, income will continue to be taxed to the grantor, even though for transfer tax purposes the grantor will be considered to have parted with the property.1 This may over time reduce transfer taxes since the grantor is in effect making a tax-free gift to trust beneficiaries of money needed to pay the income tax liability of the trust. iii. Trust Income Accumulates Without Imposition of Tax. Assume that the grantor has sold a family business worth $5 million to the trust, and that each year the business is expected to generate approximately $100,000 in profit. Assume further that the trust is the owner of the business for transfer tax purposes.2 With the grantor trust in place, the grantor will pay income tax on the $100,000 of yearly income earned by the business. If the business had instead been given outright to the children, they would have been required to pay income taxes on the profits of the business. vi. For as long as grantor trust status continues, trust income is taxed to the grantor. A corollary of the grantor trust rules would logically provide that no taxable event occurs on the sale of assets to the grantor trust because the grantor has presumably made a sale to himself of trust assets.4 If this hypothesis is correct, the grantor can sell appreciated assets to the grantor trust, effect a complete transfer and freeze for estate tax purposes, and yet trigger no capital gains tax on the transfer of the appreciated business into the trust. i. Note Could Contain a Balloon Payment Provision. Consideration received by the grantor in exchange for assets sold to the IDT may be either cash or a note. If a business is sold to the trust, it is unlikely that the business would have sufficient liquid assets to satisfy the sales price. Furthermore, paying cash would tend to defeat the purpose of the trust, which is to reduce the size of the grantor’s estate. Therefore, the most practical consideration would be a promissory note payable over a fairly long term, perhaps 20 years, with interest-only payments in the early years, and a balloon payment of principal at the end.5 This arrangement would also minimize the value of the business that “leaks” back into the grantor’s estate. For business reasons, and also to underscore the bona fides of the arrangement, the grantor could require the trust to secure the promissory note by pledging the trust assets. The Note should permit prepayment, which can be of benefit if the parties wish to terminate the transaction earlier, or in the even the assets fall in value and the parties renegotiate the term of the Note. ii. Payments in Kind if Insufficient Cash. If there is insufficient cash flow to make payments on the Note, resort will have to be made to payments in kind. However, payments in kind conflict with the grantor’s desire in selling assets to the trust, and would also require costly valuations. iii. Caution. Although balloon payments may be most desireable for the grantor, periodic payments of principal and interest imbue the note with a greater degree of commercial reasonableness. Provided the other terms of the note are commercially reasonable, the provision for a balloon payment of principal at the end of the term of the note should not be problematic. However, the more the terms of the note deviate from those of a commercial loan, and the higher the debt to equity ratio, the greater the chance the IRS will assert that the debt is actually disguised equity. In this case, the IRS could argue that inclusion in the grantor’s estate should result from IRC §2036. iv. Note May Provide for Renegotiation of Interest Rate. If the value of the assets sold to the trust decreased significantly, the trust may seek to renegotiate the interest rate if the Applicable Federal Rate has decreased since the date of the sale of assets to the trust. Alternatively, the grantor could sell the note, at a discounted value, to another grantor trust. However, to the extent renegotiation is not feasible, what will occur is that wealth will be transferred back into the grantor’s estate, which is the opposite result to that desired. v. Note Need Bear Interest Only at AFR, Not 120% of AFR as With GRAT. The note issued in exchange for the assets must bear interest at a rate determined under § 7872, which references the applicable federal rate (AFR) under §1274.6 In contrast, a qualified annuity interest such as a GRAT must bear interest at a rate equal to 120 percent of the AFR. A consequence of this disparity is that property transferred to a GRAT must appreciate at a greater rate than property held by an IDT to achieve comparable transfer tax savings. As with a GRAT, if the assets fail to appreciate at the rate provided for in the note, the IDT would be required to “subsidize” payments by invading the principal of the trust. c. Consequences of Transferred Basis While no taxable event occurs when the grantor sells assets to the IDT in exchange for the note, if grantor trust status were to terminate during the term of the note, the trust would no longer be taxed as a grantor trust. This would result in the immediate gain recognition to the grantor, who would be required to pay tax on the unrealized appreciation of the assets previously sold to the trust. Note that for purposes of calculating realized gain, the trust will be required substitute the grantor’s basis: Even though the assets were “purchased” by the trust, no cost basis under § 1012 is allowed since no gain will have been recognized by the IDT in the earlier asset sale. Another situation where gain will be triggered is where the trust sells appreciated trust assets to an outsider. One way of mitigating this possibility would be for the grantor to avoid initially selling appreciated assets to the trust. If this is not possible, the grantor could also substitute higher basis assets of equal value during the term of the trust, as discussed below. i. Sale of Appreciated Assets Not Ideal. Care should be exercised in selling highly appreciated assets to the grantor trust for another reason as well: if the grantor were to die during the trust term, the note would be included in the grantor’s estate at fair market value. However, the assets which were sold to the trust would not receive the benefit of a step-up in basis pursuant to § 1014(a). Any gift tax savings occasioned by the transfer of assets could be negated by the failure of the trust to receive an increase in basis. ii. Assets Decline in Value. What happens if the assets in the trust decline in value, so that the payments under the note can no longer be made? (1) One option is for the trustee and grantor to renegotiate the terms of the Note, perhaps by lengthening the term and decreasing the interest rate. It is possible that the IRS would assert that a gift had been made in this situation. (2) Another option would be to sell the note to another grantor trust whose beneficiaries are the same. Since the purchase price would be lower, there is more of a chance that future appreciation would be shifted to family members. (3) Finally, the grantor could extinguish the Note in exchange for the return of the assets sold to the trust. This approach might violate the fidicuary obligations of the Trustee. i. IRC § 2702. The rules of Chapter 14 must also be considered. If § 2702 were to apply to the sale of assets to a grantor trust, then the entire value of the property so transferred could constitute a taxable gift. However, it appears those rules do not apply, primarily because of the nature of the promissory note issued by the trust. The note is governed by its own terms, not by the terms of the trust. The holder in due course of the promissory note is free to assign or alienate the note, regardless of the terms of the trust, which may contain spendthrift provisions. Ltr.Ruls 9436006 and 9535026 held that neither § 2701 nor § 2702 applies to the IDT promissory note sale, provided (i) there are no facts present which would tend to indicate that the promissory notes would not be paid according to their terms; (ii) the trust’s ability to pay the loans is not in doubt; and (iii) the notes are not subsequently determined to constitute equity rather than debt. iii. Beneficiaries as Guarantors. In meeting the 10 percent threshold, the grantor himself should make a gift of these assets so that after the sale in exchange for the promissory note, the grantor will be treated as the owner of all trust assets. The IRS stated in PLR 9515039 that IRC § 2036 could be avoided if beneficiaries were to act as guarantors of payment of the promissory note.9 To enhance the bona fides of the note, all trust assets should be pledged toward its repayment. To accentuate the arm’s length nature of the asset sale, it is preferable that the grantor not be the trustee. (1) Guarantee Could be Counterproductive. However, the grantor should be circumspect in the use of guarantees. If the assets decline in value, the guarantee could result in wealth being retransferred to the grantor, which result is exactly the opposite of that desire. In addition, the guarantee will be liability of the guarantor, and will be required to be shown on the guarantor’s balance sheet. iv. Grantor’s Payment of Income Tax of Trust Normally Beneficial. Payment of grantor trust income by the Grantor is a desireable feature of sales of assets to grantor trusts, since trust assets continue to grow without imposition of income tax. The payment by the grantor of the income tax liability of the grantor trust can be considered a gift-tax free gift of the income tax liability by the grantor to the trust. (1) Trustee May be Given Discretion to Reimburse Grantor For Income Taxes Paid. Nevertheless, the grantor at times may not wish to pay the income tax liability of the trust. If the trust instrument gives the Trustee the discretion to reimburse the grantor for income tax payments made by the grantor, inclusion under IRC §2036 will not result. However, if there is an implied understanding that the grantor will be reimbursed for the income tax payments, it is the IRS position that inclusion under §2036 will result. Rev. Rul. 2004-64.
i. Sale of Assets Not Occurring During the ETIP. The sale of assets to a grantor trust has particularly favorable Generation Skipping Transfer (GST) tax consequences. Since the initial transfer of assets to the grantor trust is a complete transfer for estate tax purposes, there would be no possibility of the assets later being included in the grantor’s estate. The transfer would be defined as one not occuring during the “estate tax inclusion period” (ETIP). Accordingly, the GST tax exemption could be allocated at the time of the sale of the assets to the grantor trust11. (1) Contrast GRAT. In sharp contrast, the GST exemption may not be allocated until after the term of a GRAT has expired.12 If the grantor of a GRAT were to die before the expiration of the trust term, all of the assets in the GRAT would be included in the grantor’s estate at their appreciated value. This would require the allocation of a greater portion of the GST exemption to shield against the GST tax. The inability to allocate the GST exemption using a GRAT is quite disadvantageous when compared to the IDT, where the exemption can be allocated immediately after the sale, and all post-sale appreciation can be protected from GST tax. i. Grantor Should Not be Trustee. Trustee designations should also be considered. Ideally, the grantor should not be the trustee of an IDT, as this would risk inclusion in the grantor’s estate, especially if the grantor could make discretionary distributions to himself. If discretion to make distributions to the grantor is vested in a trustee other than the grantor, then the risk of adverse estate tax consequences is reduced. The risk is reduced still further if the grantor is given no right to receive even discretionary distributions from the trust. If the grantor insists on being the trustee of the IDT, then the grantor’s powers should be limited to administrative powers, such as the power to allocate receipts and disbursements between income and principal. The grantor may also retain the power to distribute income or principal to trust beneficiaries, provided the power is limited by a definite external standard. iii. Diversification. The trust should eliminate the normal requirement that the Trustee be required to diversify the investments of the trust. i. Trust Becomes Irrevocable. The following events occur upon the death of the grantor: (i) the IDT loses its grantor trust status; and (ii) presumably, assets in the IDT would be treated as passing from the grantor to the (now irrevocable) trust without a sale, in much the same fashion that assets pass from a revocable living trust to beneficiaries. For reasons similar to those discussed above with respect to sales of appreciated trust assets, the basis of trust assets would not be stepped-up pursuant to §1014(a) on the death of the grantor, because the assets will not be included in the grantor’s estate. This is in sharp contrast to the situation obtaining with a GRAT, where the death of the grantor prior to the expiration of the trust term results in the entire amount of the appreciated trust assets being included in the grantor’s estate. (1) Income Tax at Grantor’s Death? Some authorities believe that if the grantor dies while the Note is outstanding, the estate could realize capital gains to the extent that the debt exceeds the trust’s basis in the assets. (2) SCIN Might Avoid Inclusion in Grantor’s Estate. It might be possible to avoid inclusion of the note in the seller’s estate if a self-canceling installment note (SCIN) feature were included in the note. A SCIN is an installment which terminates on the seller’s death. Any amounts payable to the seller would be cancelled at death, and would be excluded from the seller’s estate. However, since the seller’s death during the term of the note will result in cancellation of liability under the terms of the note, the note payments would have to be increased accordingly to avoid a deemed gift at the outset. As a result of these increased payments, if the seller did survive the full term of the note, the amount payable to the seller from the trust utilizing the SCIN would be greater than if a promissory note without a SCIN had been utilized. This would tend to increase the seller’s taxable estate. (a) Conversion of Note to Note with SCIN. An existing Promissory Note can be renegotiated to include a SCIN, provided the grantor is not terminally ill (i.e., not a 50% probability that grantor will die within 1 year). The inclusion of the SCIN will require an additional premium, determined actuarilly. h. Comparison to GRAT. Aside from the lack of unfavorable estate tax consequences resulting from the early death of the grantor, the asset sale technique also permits the grantor to effect a true estate freeze by transferring assets at present value from his estate without being subject to the limitations imposed by IRC §§ 2701 or 2702, to which the GRAT is subject. In addition, as noted, the GST exemption may be allocated to the assets passing to the trust at the outset, thus removing from GST tax any appreciation in the assets as well. In these respects, the IDT is superior to the GRAT. The principal disadvantages are that (i) no step-up in basis is received at the death of the grantor for assets held by the trust (or if the trust sells appreciated assets during its term); and (ii) the technique, though sound in theory, has not been tested in the courts. i. IRS Could Claim No Bona Fide Sale. The general principles governing the tax consequences of the asset sale seem firmly grounded in the Code and the law, and their straightforward application appears to result in the tax conclusions which have been discussed. Nevertheless, the IRS could challenge various parts of the transaction, which if successful, could negate some (or all) of the tax benefits sought. In particular, the IRS could attempt to assert that (i) the sale by the grantor to the trust does not constitute a bona fide sale; (ii) § 2036 applies, with the result that the entire value of the trust is includible in the grantor’s estate; (iii) the initial asset “sale” is actually a taxable sale which results in immediate tax to the grantor under IRC § 1001; or (iv) that § 2702 applies, the annuity is not qualified, and a taxable gift occurs at the outset. ii. IRS Could Assert Step Transaction Doctrine. The IRS has recently interposed the step transaction doctrine in situations where limited liability companies were formed shortly before the sale to the grantor trust. In view of this, it is advisable to permit the limited liability company (or partnership) to “age” prior to transferring the asset to the trust. iii. Filing of Gift Tax Return to Commence Statute. Although the sale to a grantor trust is not a gift, the grantor may wish to file a gift tax return solely for the purpose of commencing the statute of limitations. If this route is taken, the transaction should be disclosed on the return. Often, the transaction will be disclosed in any event by reason of the grantor’s gift of “seed” money to the trust. i. Discounted LLC Interests Result in Lower Note Payments. By combining the LLC form with asset sales to grantor trusts, it may be possible to achieve even more significant estate and income tax savings. LLC membership interests are entitled to minority discounts since the interests are subject to significant restrictions on transfer and management rights. If the value of the LLC membership interest transferred to the IDT is discounted for lack of marketability and lack of control, the value of that interest will be less than a proportionate part of the underlying assets. Consequently, in the case of an asset sale to the IDT, the sale price will be less than if the assets had been directly sold to the IDT. ii. Illustration of Sale of Asset to Grantor Trust. (a) Parent may give children the money to purchase their interests. (4) In determining the FMV of the LLC interest to be sold to the trust, Parent engages the services of a professional valuation discount appraiser and a real estate appraiser. (a) It is determined that the value of the real estate is to be discounted by 30 percent after application of the lack of control and lack of marketability discounts. (a) The gift reduces the available lifetime gift tax exclusion from $1 million to $0.937 million. (i) Parent files a gift tax return in April, 2011 reporting the gift of $63,000 to the grantor trust in 2010. (a) The required yearly interest payments under the Promissory Note are $28,162. (i) The principal amount of the Promissory Note reflects the valuation discount applied to the real estate sold to the grantor trust. (7) If the underlying real estate appreciates at a yearly rate of 10 percent, the value of the underlying assets purchased by the trust in exchange for the promissory note would increase by $90,000 in the first year (i.e., $900,000 x .10). (a) The grantor will report and pay tax on the distributive share of income reported by the LLC to the grantor trust on a form k-1 in early 2011. (i) The payment by the grantor of the income tax liability of the trust will result in trust assets continuing to appreciate without the imposition of income tax on trust assets. 1) The grantor trust gives discretion to the trustee to reimburse the grantor for income tax payments. (8) Had the LLC membership interests not been discounted, the real estate would have commanded a purchase price by the grantor trust of $900,000, and the required yearly interest payments would have instead been $40,230 (i.e., $900,000 x .0447). (a) By discounting the property purchased by the grantor trust to reflect minority and lack of marketability discounts, the required interest payments to parent have been reduced from $40,230 to $28,162. (b) If the underlying assets grow at a rate of 10 percent, then 68.71 percent of the growth ($61,838/90,000) will remain in the trust. (c) It is apparent that more value can be transferred to family members if the property purchased by IDT in exchange for the promissory note can be discounted. (6) the sale of the real estate to the LLC would not result in an ETIP. 2 IRC Secs. 2036 and 2038, which cause the retention of interests or powers to result in estate inclusion must be avoided when funding an IDT. The retention by a grantor-trustee of administrative powers, such as the power to invest and the power to allocate receipts and disbursements between income and principal will not result in inclusion, and will not negate the transfer for transfer tax purposes, provided the powers are not overbroad and are subject to judicially enforceable limitations. See Old Colony Trust Co., 423 F2d 601 (CA-1, 1970). a. Many estate planning trusts also possess significant asset protection features. A qualified personal residence trust (“QPRT”) results when an interest in real property, which could be attached by a creditor, is converted into a mere right to reside in the residence for a term of years. The sale of an asset to a “defective” grantor trust in exchange for a promissory note converts the asset into an instrument which may be unattractive to a creditor if it provides only for interest payments. b. Since these trusts are ubiquitous in estate planning, they are less likely to be vulnerable to a claim that they were formed with an intent to hinder, delay or defraud creditors. Less commonly, trusts are called upon to achieve purely asset protection objectives. Their effectiveness in this role appears to militate in favor of their greater use. d. The effect of a discretionary distribution provision on the rights of a creditor are profound. If the trust provides that (i) the beneficiary cannot compel the trustee to make distributions, and assuming that (ii) the rights of a creditor can be no greater than those of the beneficiary, it follows that (iii) a creditor cannot compel the trustee to make distributions. Therefore, properly limiting the beneficiary’s right to income from the trust may well determine the extent to which trusts assets are protected from the claims of creditors. e. Failure to properly limit the beneficiary’s right to income from an APT can have deleterious tax consequences if the creditor is the IRS. TAM 0017665 stated that where the taxpayer had a right to so much of the net income of the trust as the trustee determined was necessary for the taxpayer’s health, maintenance, support and education, the taxpayer had an identifiable property interest in the trust which was subject to a federal tax lien. Since the discretion of the trustee was broadly defined, and subject to an “ascertainable standard” rather than being absolute, the asset protection feature of the trust was diminished. f. If asset protection is a major objective, it would be inadvisable to draft a trust in which the trustee’s obligation to distribute income is subject to an ascertainable standard, rather than within the trustee’s absolute discretion. However, that is not enough: Even if the trustee’s discretion is absolute, a court may review the trustee’s discretion. Fortunately, courts have generally been disinclined to substitute their judgment for that of the trustee, even where the trustee’s discretion is absolute. The Uniform Trust Code is in accord, providing that a creditor of a beneficiary may not compel a distribution even where the trustee has abused his discretion. g. A beneficiary should not be named sole trustee of his own discretionary APT, since the interest of a beneficiary who has discretion to determine his own distributions may be attached by a creditor. On the other hand, if the sole trustee — even a beneficiary — has no discretion with respect to distributions made to himself, his interest in the trust would not likely be subject to attachment by a creditor. However, amounts actually distributed could be reached. h. Spendthrift Trusts. Even if the trustee’s discretion is absolute, the APT should also contain a valid spendthrift clause, since it is not enough for asset protection purposes that a creditor be unable to compel a distribution. The creditor must also be unable to attach the beneficiary’s interest in the trust. A spendthrift provision prevents the beneficiary from voluntarily or involuntarily alienating his interest in the trust. The Supreme Court, in Nichols v. Eaton, 91 U.S. 716 (1875), recognized the validity of a spendthrift trust, holding that an individual should be able to transfer property subject to certain limiting conditions. i. A spendthrift trust will thus protect a beneficiary from (i) his own profligacy or bankruptcy; (ii) his torts; and (iii) many of his creditors, (including his spouse). No specific language is necessary to create a spendthrift trust, and a spendthrift limitation may even be inferred from the intent of the settlor. Still, it is preferable as well as customary to include spendthrift language in a trust. A spendthrift provision may also provide that required trust distributions become discretionary upon the occurrence of an event or contingency specified in the trust. Thus, a trust providing for regular distributions to beneficiaries might also provide that such distributions would be suspended in the event a creditor threat appears. j. A few exceptions could reduce the effectiveness of a spendthrift trust. As indicated above, if a beneficiary is also the sole trustee of a discretionary spendthrift trust, the trust will be ineffective as against creditors’ claims. Other exceptions are in the nature of public policy exceptions. Thus, assets in a spendthrift trust may be reached to enforce a claim against the beneficiary for support of a child. Courts might also invalidate a spendthrift trust to satisfy a judgment arising from an intentional tort. Furthermore, a spendthrift trust would likely be ineffective against claims made by the government relating to taxes, since the strong public policy in favor of the government collecting taxes may be deemed to outweigh the public policy of enforcing spendthrift trusts. i. A “self-settled” trust is one which the beneficiary creates for his own protection. Here, the settler is either one of the beneficiaries or the sole beneficiary of the trust. A self-settled trust may also be spendthrift. Prior to 1997, neither the common law nor the statutory law of any state permitted a self-settled trust to be endowed with spendthrift trust protection. ii. However, since 1997, five states, including Delaware and Alaska, have enacted legislation which expressly authorizes the use of self-settled spendthrift trusts. A self-settled spendthrift trust, if established in one of these five states, may effectively allow an individual to put assets beyond the reach of creditors while retaining some control over and access to trust assets. These states now compete with jurisdictions such as the Cayman Islands and Bermuda, which for many years have been a haven for those seeking the protection of a self-settled spendthrift trust. iii. Most states, including New York, continue to abhor self-settled spendthrift trusts. This is true even if another person is named as trustee and even the trust is not created with an intent to defraud existing creditors. New York’s strong public policy against self-settled spendthrift trusts is evidenced in EPTL §7-3.1, which provides that “[a] disposition in trust for the use of the creator is void as against the existing or subsequent creditors of the creator.” Still, there appears to be no reason why a New York resident could not transfer assets to the trustee of a self-settled spendthrift trust situated in Delaware or in another state which now permits such trusts. v. Important estate planning objectives may be furthered by establishing an APT. If a self-settled spendthrift trust is created in Delaware, the creditor protection achieved will likely eliminate the possibility of estate inclusion under IRC §2036. If the settlor’s spouse is beneficiary, there is even less likelihood of estate inclusion. However, normal estate tax rules must be considered. For example, the estate of a settler who retains the right to receive trust distributions will be required to include trust assets in the estate under IRC § 2036. This problem will not be avoided even if the “right” to receive income is within the discretion of the Trustees, since it is the retained right which causes inclusion. PLR 200944002 stated that a Trustee’s authority to make discretionary distributions to the Grantor will not, by itself, cause inclusion under IRC §2036. However, by utilizing a domestic APT in which the settler retains no right whatsoever to income, inclusion under IRC § 2036 should be avoided. a. Treasury’s 2010 budget proposal includes a requirement that all GRATs have a term of not less than 10 years. This limitation would be intended to ensure that the transaction has at least some downside risk. The 10 year requirement would make it unlikely that many taxpayers over 75 years old would utilize a GRAT. Instead, those individuals would likely use sales to grantor trusts to shift appreciation in transferred assets to donees. Note that the proposal would not affect the use of “zeroed-out” GRATS, where the initial taxable gift is negligable. Congress is contemplating requiring a minimum 10-year period for GRATs. This would not effect the taxpayer’s ability to utilize a “zeroed-out” GRAT, which would result in little or no current taxable gift. Also, the proposal would not prevent the taxpayer from funding the GRAT with highly appreciating assets. To benefit from current law, estate planners may wish to use GRATs whose duration is less than ten years, but more than two or three years. The rationale for this is that if only a short-term GRAT is used, the taxpayer will be forced to choose within a few years whether to use a ten-year GRAT or use no GRAT. b. Front-Loaded GRATs.. Under IRC §2036, if the grantor dies before the term of the GRAT, inclusion in the grantor’s gross estate occurs. In a front-loaded GRAT, annuity payments during the early term of the GRAT are disproportionately large. If the grantor outlives this period, but dies at a time when the annuity payments are much lower, the amount of GRAT assets included in the gross estate is lower. This is because fewer assets would be required to fund the annuity. Although no action has yet been taken, to reduce the effectiveness of short-term GRATs in this respect, Congress may limit the amount by which annuities can be reduced in later years. c. Reducing the Risk of Death in Long-Term GRATs. i. Grantor Sells Retained Annuity Interest. If the grantor’s retained annuity interest is sold to a grantor trust, no income tax consequences will occur. However, under IRC §2035, if the grantor were to die within three years of the sale, the retained annuity interest would still be includable in the grantor’s estate under IRC §2036. Although some have suggested that the grantor may avoid the three-year rule by simply purchasing the remainder beneficiary’s interest, the IRS will likely object to this as a “commutation”. See Rev. Rul. 98-8 (IRS objects to purchase of remainder QTIP interest). (1) Caution: GRAT Must Permit Transferability of Interests. Most trusts contain sprendthrift provisions, which prevent the transfer of interests. If the purchase of an interest in a GRAT from a beneficiary is contemplated, the trust must not contain a spendthrift provision. (3) Repurchasing GRAT Assets. If the value of assets in a funded GRAT decline, the grantor may wish to repurchase those assets and fund a new GRAT. [discuss]. ii. The grantor can also sell the poorly perform asset to a second grantor trust (with the same beneficiaries) for cash or a promissory note. (2) The GRAT should not contain a spendthrift clause, as this would impair the ability of the grantor to transfer his annuity interest. (3) The GRAT should not contain provisions which would impair the ability of the Trustee to sell assets to outside purchasers. e. Exceptionally Performing GRATs. If the GRAT has performed extremely well, and the grantor wishes to lock in the wealth transfer achieved, he can substitute assets of equal value (assuming again that the trust contains such a power) but which carry less downside potential. The grantor could also sell the asset for cash or a promissory note. f. GRAT Assets Transfer Too Much Wealth. In certain cases, the assets in the GRAT perform so well that the wealth transfer to beneficiaries exceeds that which the grantor desired. In this case of overperforming GRAT assets, the grantor can (i) purchase the overperforming asset from the GRAT, thereby limiting further wealth shift to trust beneficiaries; (ii) substitute cash or other assets not expected to perform as well; (iii) add or change trust beneficiaries; or (iv) turn off grantor trust status, as this will cause trust income to be taxed to the now nongrantor trust, rather than to the grantor, reducing the value of trust assets by the income tax liability of the trust. i. Drafting Trust Provision Limiting Beneficiary’s Interest. The grantor may also expressly limit the amount a beneficiary can receive from the trust. Thus, the trust could provide that upon the termination of the trust term, Beneficiary A will receive $100x dollars, with the remainder to be distributed to Beneficiary B.
g. GRAT assets Illiquid. The GRAT assets may be illiquid or difficult to value, although not necessarily without significant wealth. Although an in kind distribution may be made, if the GRAT assets consist of interests in a family business, valuing the interest may be difficult, and this difficulty may be compounded by applicable valuation discounts available. Paying the annuity with a note is forbidden by Treasury Regulations. However, the trust may seek to borrow money from a third party. Most practitioner believe that the loan may be guaranteed by the grantor, provided the GRAT pays the grantor a fee for guaranteeing the note. i. Problems associated with an illiquid GRAT may be avoided by using a long-term GRAT whose annuity payments increase over the years. Also, it may be prudent to fund the GRAT with some cash or liquid assets at inception. h. Problem of Grantor Dying During Trust Term. If the Grantor dies during the term of the GRAT, all or part of the trust assets will be included in the Grantor’s estate. To prevent the grantor’s estate from exceeding the applicable exclusion amount and incurring an estate tax, the GRAT could provide that in the event of the death of the grantor prior to the trust term, the assets could be distributed to the surviving spouse. Estate tax would thus be averted at the death of the grantor. If the grantor is unmarried, a similar contingent bequest could be made to a charity. Note that although this solution would prevent an estate tax problem, it would also defeat the grantor’s objective of shifting wealth to other generations. i. Problem of Automatic GST Allocation. Since the assets in the GRAT may be returned to the grantor’s estate if the grantor dies during the trust term, the GRAT is subject to an “ETIP”, which is an “estate tax inclusion period.” A GST exemption becomes effective only at the end of an ETIP. Since the GST exemption is automatically allocated, the grantor should elect out of automatic allocation of the GST exemption. This can be done by attaching a statement to the gift tax return, Form 709. (1) Failure to Elect Out of Automatic GST Allocation. If the grantor fails to properly elect out of the automatic GST allocation, relief can be sought under Treas. Reg. § 301.9100-3. Relief will generally be granted if the taxpayer establishes to the satisfaction of the IRS that the taxpayer acted reasonably and in good faith. j. Failure to File Gift Tax Return Reporting GRAT. If the grantor fails to file a gift tax return adequately reporting the transfer to the GRAT, the statute of limitations will not commence. In this case, the grantor should file a late or amended gift tax return adequately disclosing the transaction. k. Adherence with Formalities. As is the case with many estate plans involving family entities and documents, adherence with formalities is important. If necessary formalities are not observed, the IRS may argue that the GRAT is not entitled to favorable tax treatment under IRC §2702. 11. Qualified Personal Residence Trusts. a. In essence, a QPRT is formed when a grantor transfers a personal residence (and some cash for expenses) into a residence trust, and retains the right to live in the residence for a term of years. If the grantor dies before the end of the trust term, the trust assets are returned to the grantor’s estate, and pass under the terms of the grantor’s will. However, if the grantor outlives the trust term, the residence passes to named beneficiaries without any gift or estate tax event. A longer trust term will increase the value of reserved term and decrease the initial taxable gift. b. Any contingent reversionary interest the grantor retains will also reduce the value of the remainder interest for gift tax purposes. Accordingly, to minimize the initial taxable gift, the trust term should be as long as possible, taking into account that estate tax benefits will be diminished if not foregone if the grantor dies before the end of that term. The QPRT is therefore a “split-interest” trust: the grantor retains a reserved use term and a contingent reversionary interest, and makes a a gift to beneficiaries of a future interest, which vests only if the grantor outlives the trust term. Note that any appreciation in the residence during the term of the trust would also have been diverted from the grantor’s estate. c. The interest rate used in valuing the retained interest is at historic lows. The lower the value of the interest rate, the lower the retained interest, and the greater the value of the taxable gift. Still, QPRTs may be attractive since real estate values are extremely low. In addition, even though the value of the retained income interest is lower during times of low interest, the value of the retained reversion also increases. 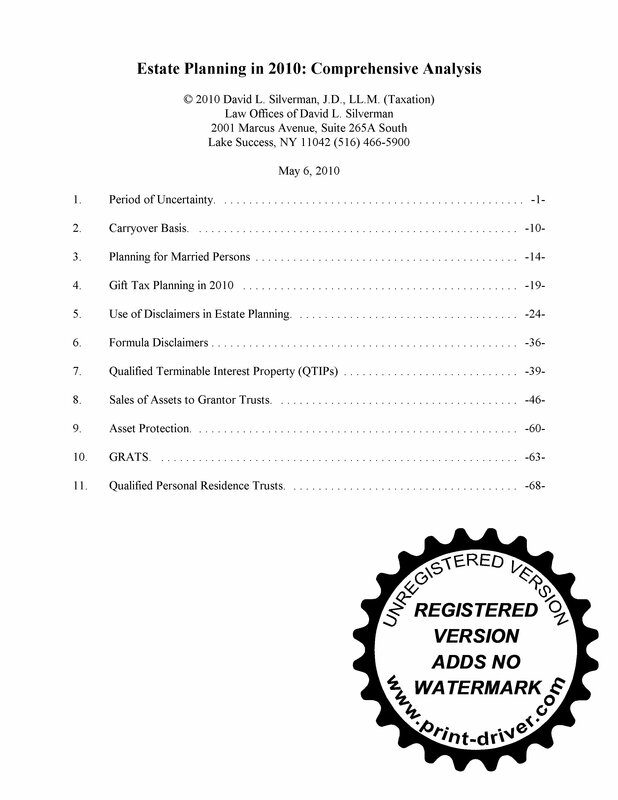 This entry was posted in Estate Planning, Estate Planning in 2010, Treatises and tagged applicable exclusion amount, asset protection, carryover basis, disclaimers, estate tax, formula disclaimers, Generation-Skipping Transfer Tax, gift tax, GRATS, GST tax, marital deduction, nys estate tax, QPRTs, QTIP, qualified personal residence trusts, retroactive estate tax, sales of assets to grantor trust, self-settled spendthrift trusts. Bookmark the permalink.